In addition to Furniture, we have a Calendar of Swing Dancing in DC, a Directory of Vintage Clothing Stores and a Guide to 1940s Collectibles. Thanks for tuning in! Feel free to Contact Me if you have questions or want to share photographs and Furniture stories with the rest of the readers. 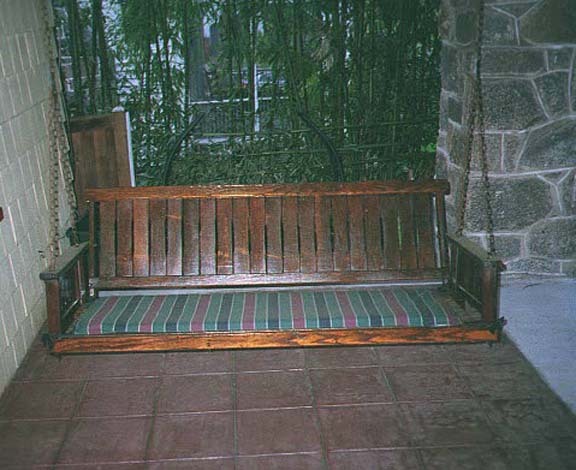 Waterfall furniture is a catchall term for molded plywood furniture that employs curved or rounded horizontal edges; hence, the term "waterfall". 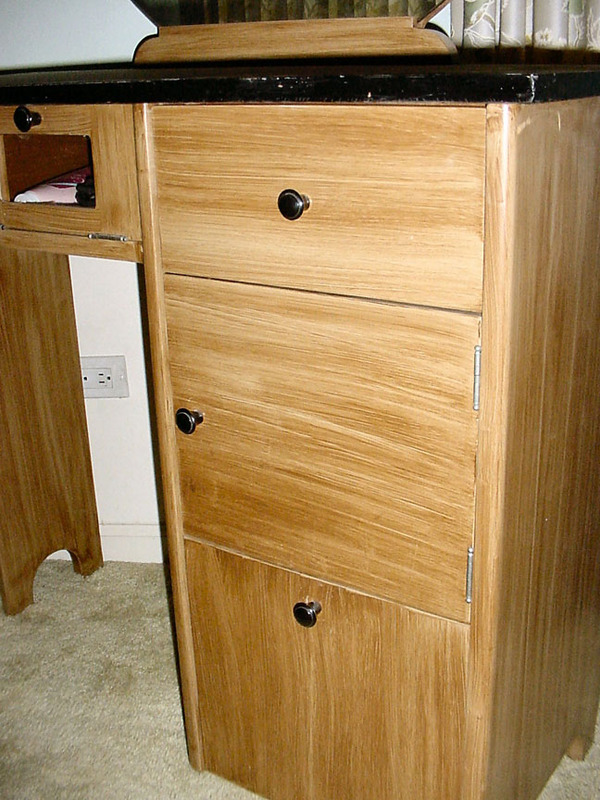 The furniture uses unusual veneer designs and often has clever Bakelite handles. 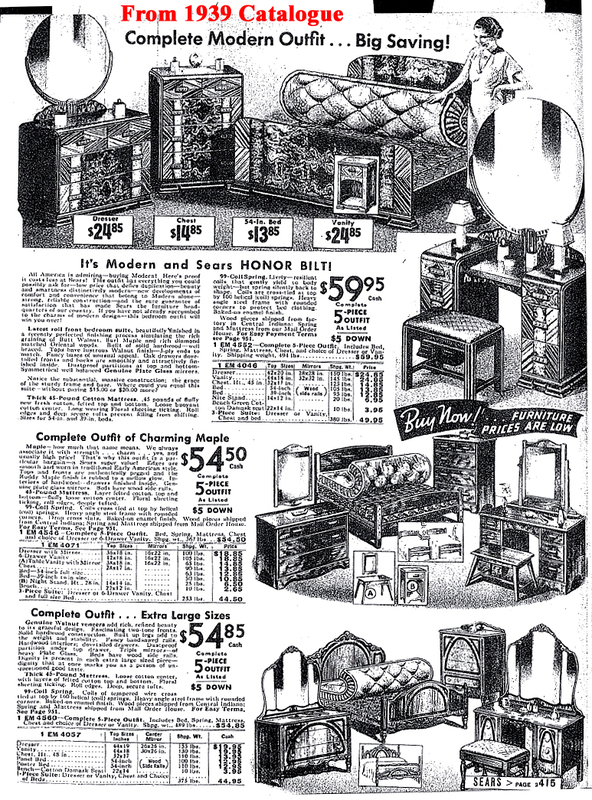 This was inexpensive furniture in its time. 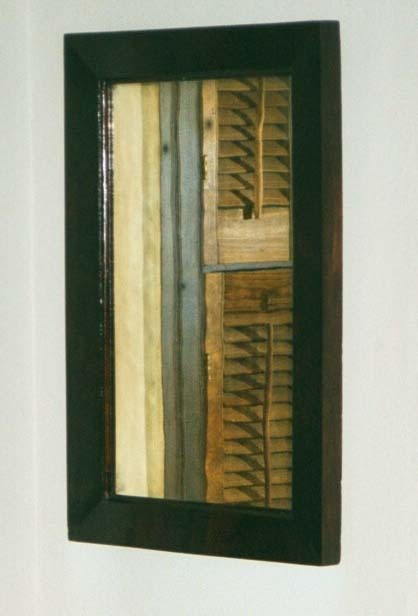 Generally, there is no "frame" -- the molded plywood sides and tops are supported by edge moldings. Often, there are no drawer glides. 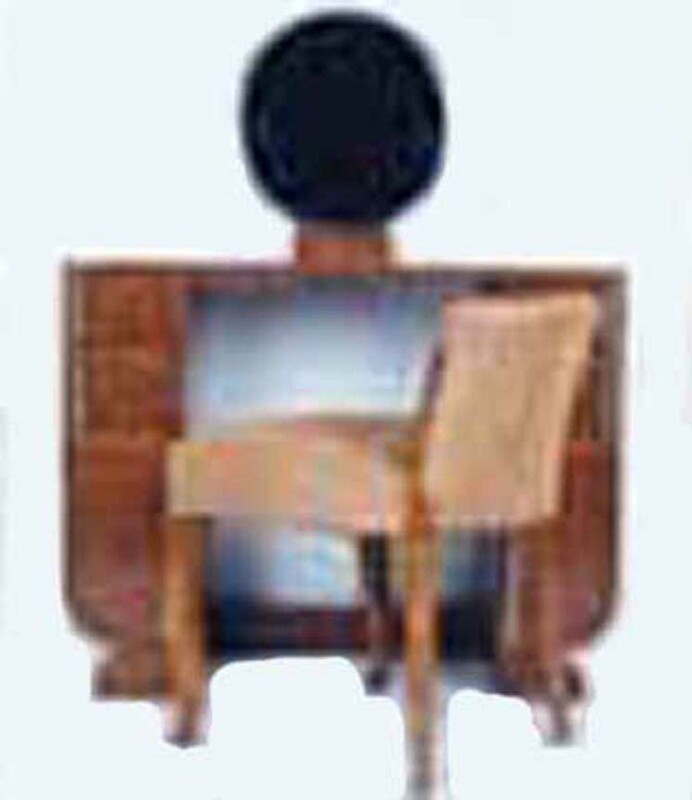 Note: we call the "Coiffeuse" a "Vanity", the French term is more accurate, meaning a place where a lady might use a large mirror to style her hair. Using more mundane materials, this style of furniture was mass-produced from the 1920s through the 1940s. Some is absolutely terrible, and a small amount is breathtaking. 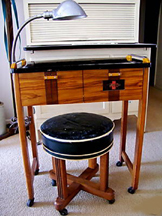 The style is most frequently seen in Bedroom Suites, although dining sets and even billiard tables were produced. 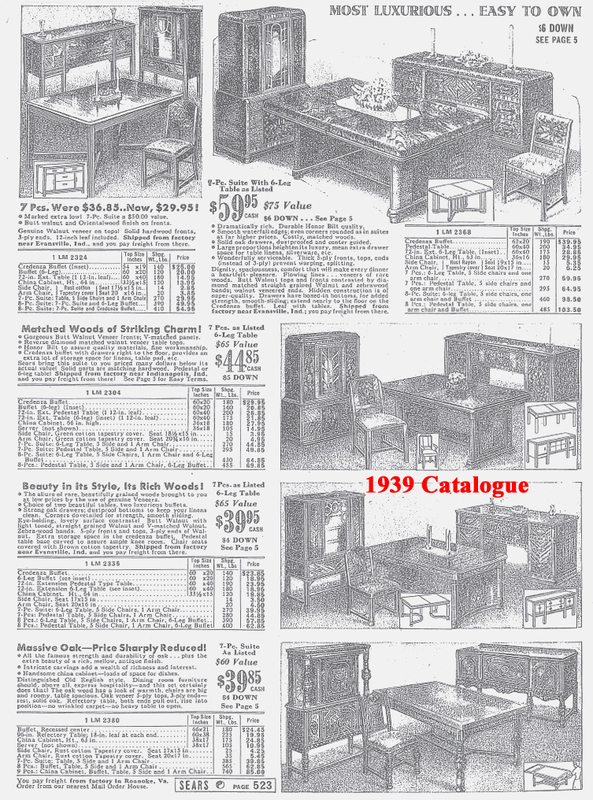 Here is a progression of styles offered in the Sears and Roebuck Catalogues from 1930 to 1939. Things that look like Art Deco are classed as "modern". 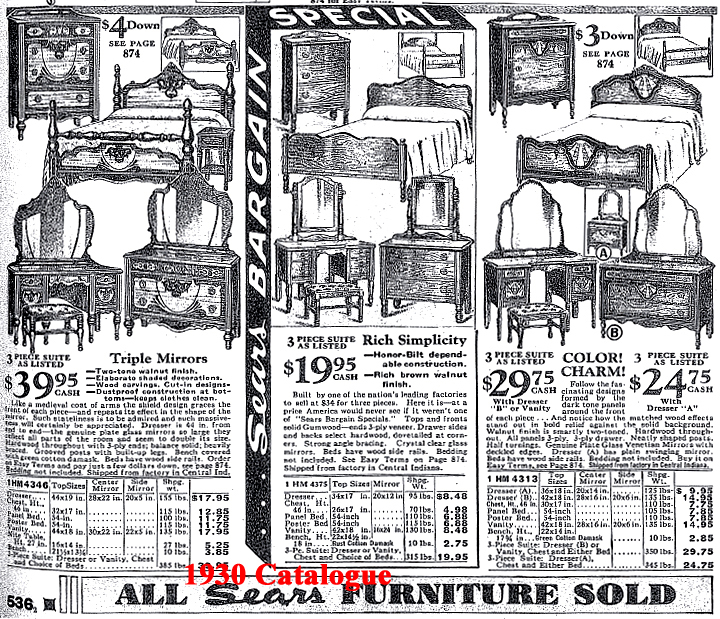 Note that it is only in 1939 that sears calculated that there would be a mass market for "modern" furniture outside the bedroom. 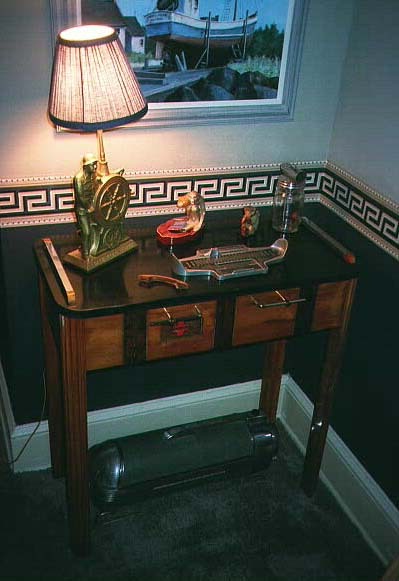 Modern is Acceptable Outside the Bedroom in 1939! The intended market was newlyweds --- during the depression, most new couples could not afford their own house; the best they could do was a room in their parents' house. Hence, the "Bedroom Suite" was probably the only thing that they owned, resulting in inordinate sentimental attachment to the furniture and a reluctance to change even though finances improved. Many couples have kept and preserved their waterfall sets until the very end. As a result many examples of the waterfall genre are available. 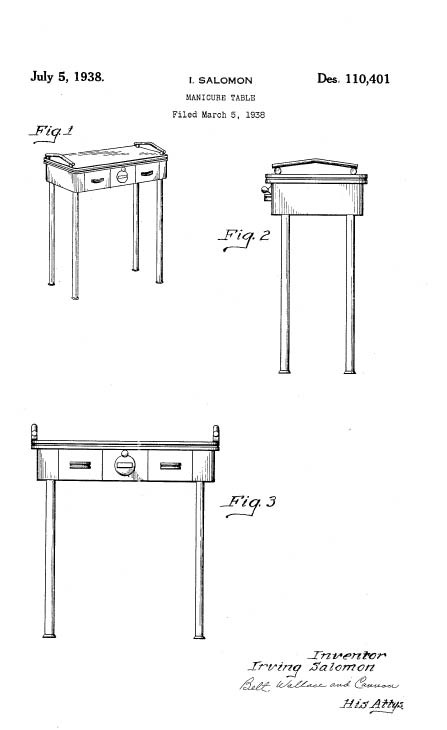 The Basic set included a bed, vanity and bench, and chest of drawers. 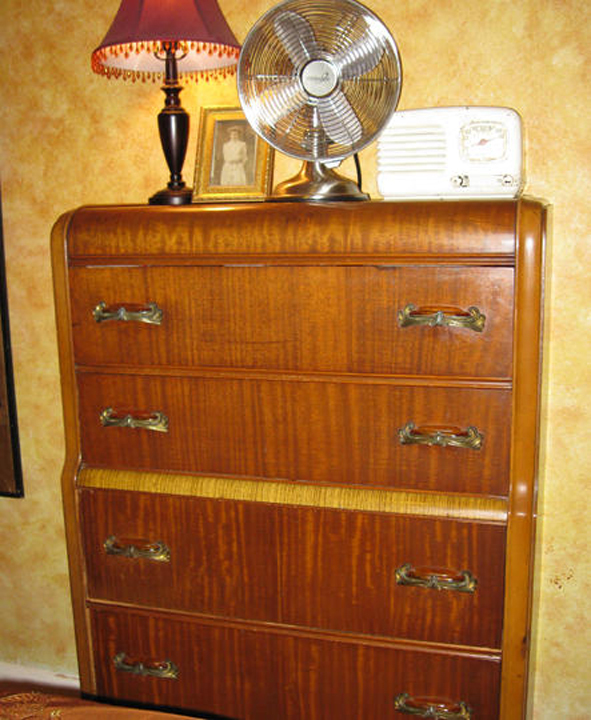 Other items included nightstands, dresser, cedar chest and armoire/chifferobe. In 1930 a basic "suite" would have cost from $19.95 to $39. 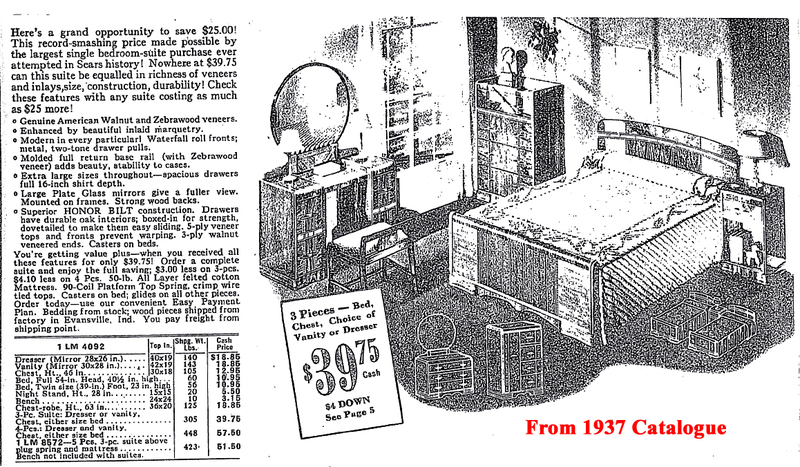 In 1937, the basic bedroom set was $39.75 -- and the "modern" version was the price leader. 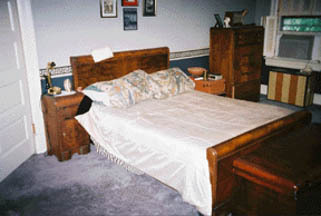 Today, a complete basic bedroom suite goes for $800-$900 in reasonable condition. 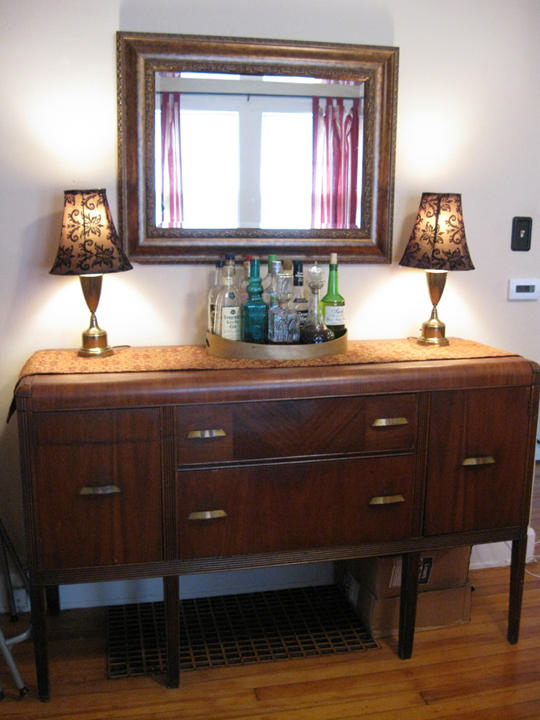 The hardest pieces to find are nightstands and vanity benches. Cedar chests go for $400 and up. The "value" is sentiment --- on an intrinsic basis, waterfall is not "Fine Furniture" because the construction techniques and materials are generally skimpy. 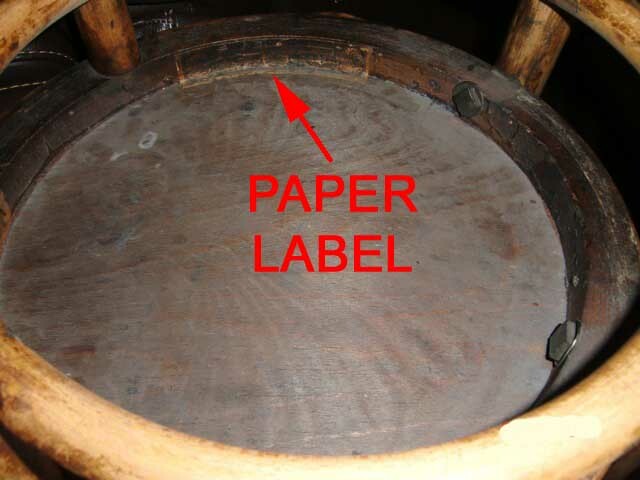 Some labels (Cavalier, Heywood-Wakefield) are exceptions because they used excellent materials. 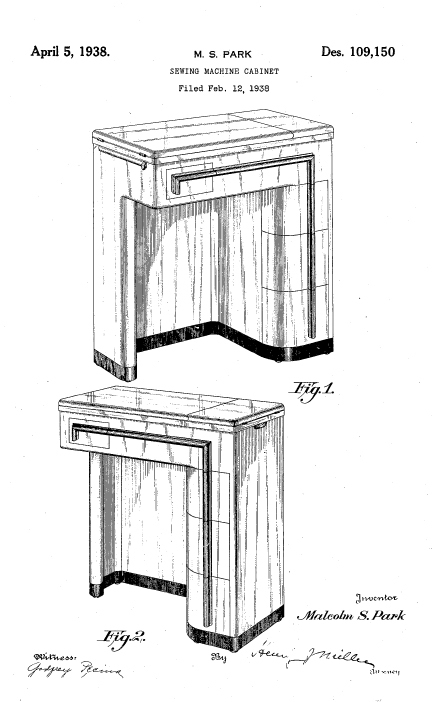 Technical advances made it possible to mass-produce "waterfall" furniture by adapting the "new" -- for the time -- material plywood. Before plywood was available, curves in wood could only be achieved by laborious and expensive means that were not at all suitable to the assembly line. 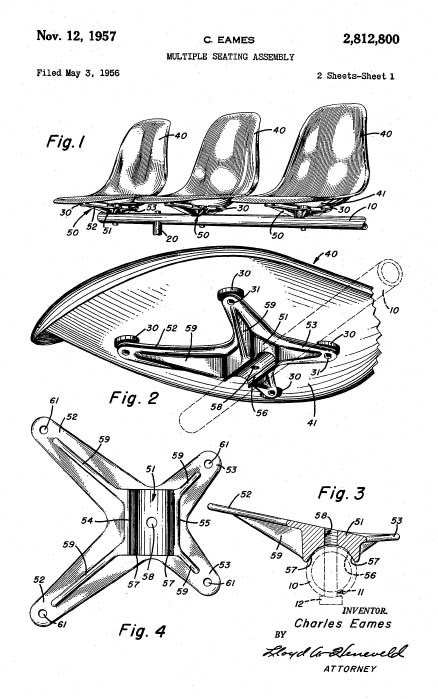 However, technology embodied in the following patents made it possible to create a large number of attractive pieces at low cost. The plywood is covered with veneer or paper-thin slices of real wood, giving the illusion that the piece is made of a more expensive wood, such as mahogany or oak. Veneer has a number of enemies, most significantly moisture that causes the veneer to detach itself from the underlying plywood substrate. 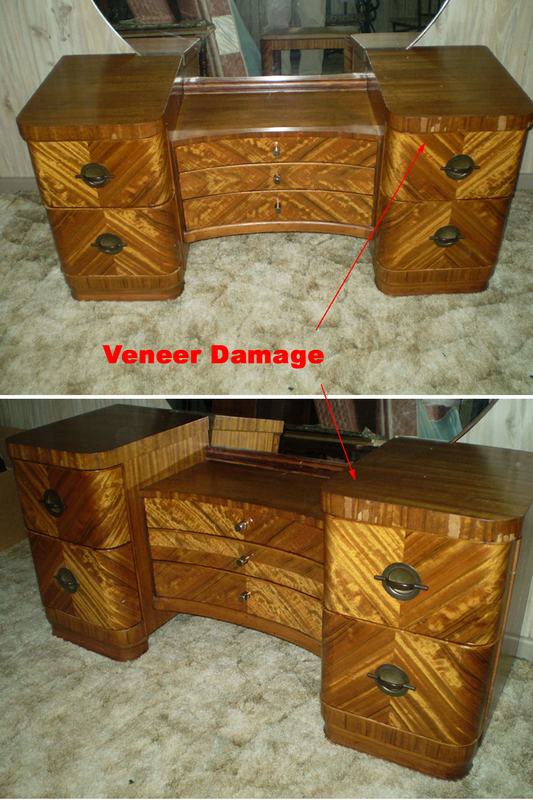 The most common veneer damage results from storing the furniture in a humid or damp basement. The veneer loosens at the base of the object and often peels away in a manner resembling "fringe". Heat, particularly cigarette burns can be a problem. If the glue gets too hot it will swell causing bubbles to form. 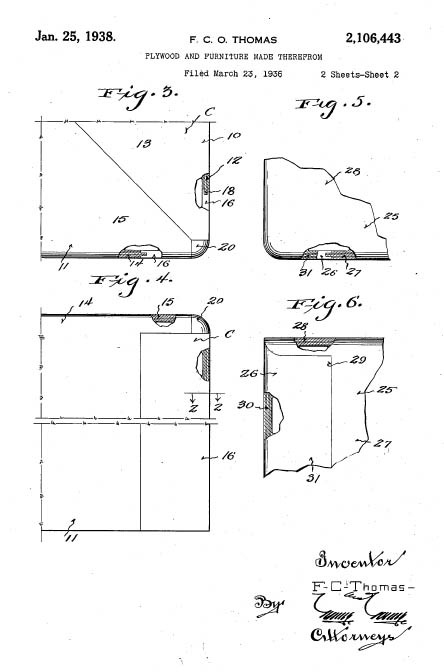 Cigarettes, matches, or other hot objects (i.e. curling irons) can actually destroy the veneer. 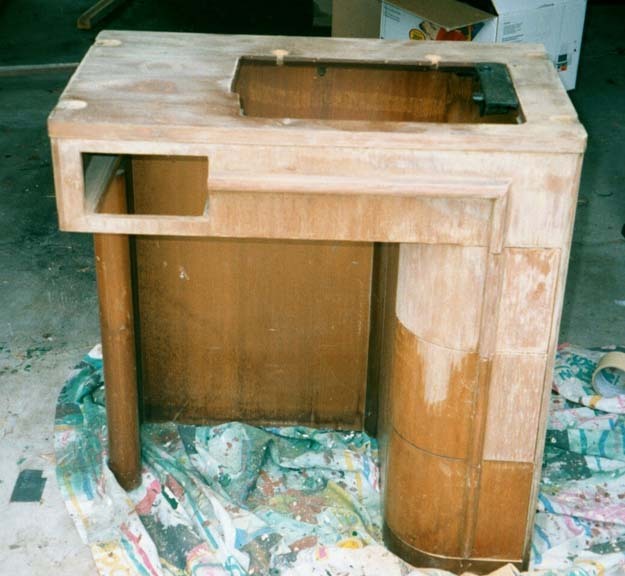 Our webpage on Restoration of a Radiobar has a number of photos illustrating veneer repair. 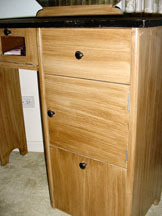 The finish is most often mahogany stain and spray shellac with very rare exceptions such as our blonde set shown below. Alcohol is the solvent for both shellac and perfume. Many times, the surface of the vanity is heavily pitted where perfume has been spilled. 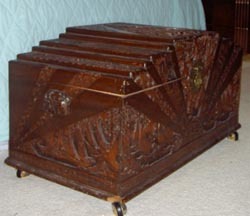 Our web page on Cavalier Cdar Chests describes several techniques for restoring and reinvigorating the shellac finish. The BIG NO-NO is "Do NOT under ANY CIRCUMSTANCES use paint stripper on a waterfall piece." First, alkaline solutions are NOT the solvent for shellac and Second, the stripper will loosen the glue and the veneer will come off. So, avoid paint strippers. This is our Waterfall bedroom set. It probably dates from the late 1930s. 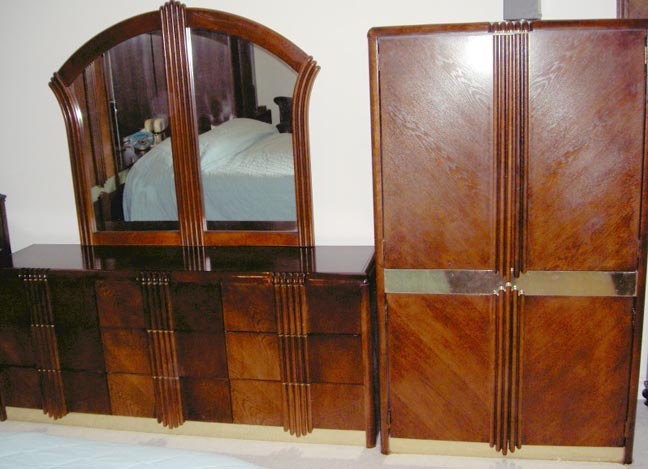 We are very lucky to have almost all the pieces associated with a set like this -- vanity, dresser, chest of drawers, bed, two nightstands, cedar chest, chair and vanity bench. 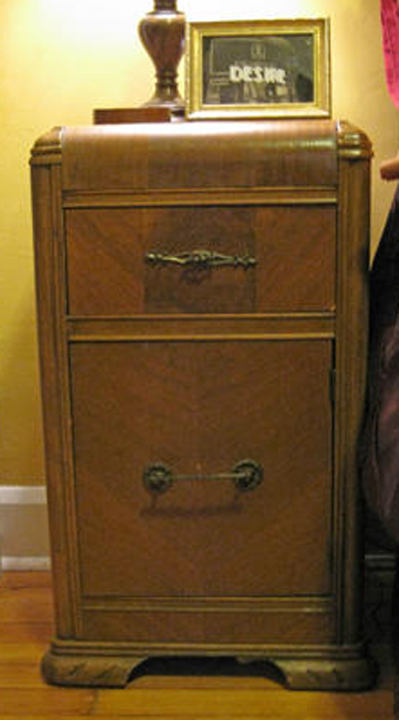 We do not have an armoire or chifferobe, but we wouln't have a place for it anyway. Some of the pieces are mixed in from other sets (like the Nightstands and the cedar chest), but the feel of the room is much like you might expect for a couple starting out their life. This furniture was very cheap, although the use of veneer effects like bookmatching makes the pieces very attractive. Waterfall has a warmth about it that is not captured by very high end furniture. This stuff will always have a very high emotional value and will remain collectible in the future. It is VERY easy to live with! 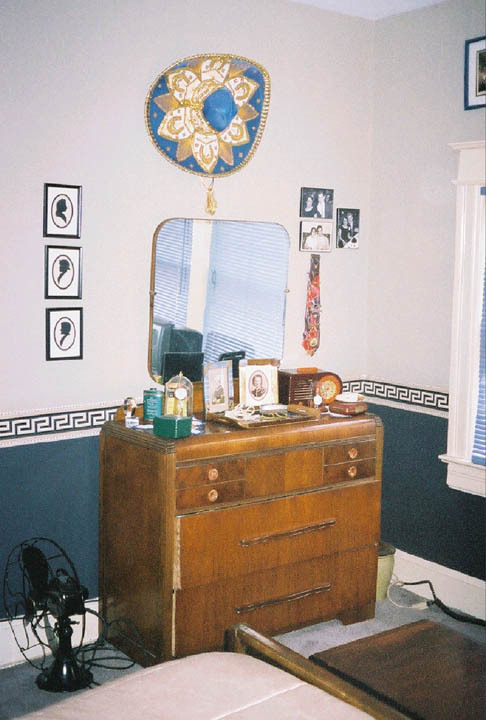 In the Vanity photo, the flanking photos are X-rays of flowers, very popular in the 1940s. 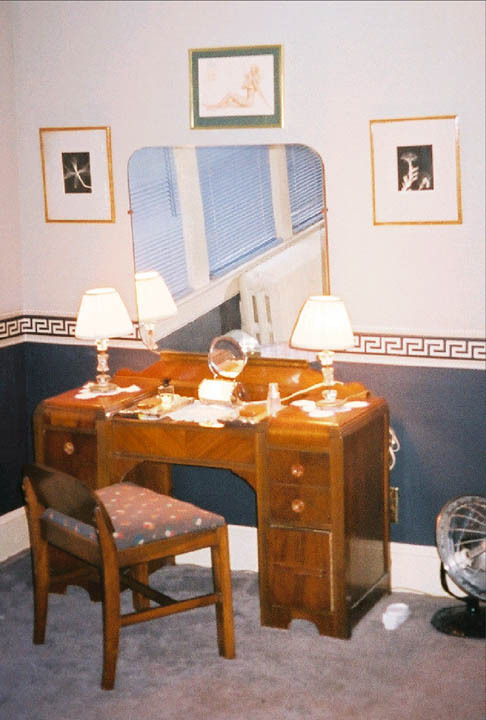 Centered above the mirror is the Vargas Girl from my birth month in the 1940s. The radiant Heater on the floor is on our Fans Page. In the Dresser photo, on left are silhouettes of my family, cut in Cedar Point, Ohio in about 1950. The Fada Radio on the right is on our Radio Page. The silver-framed pictures are of my Mom and Dad, taken in 1943. The sombrero is intended to evoke American interest in Mexico during the 1940s (an inexpensive desitnation for newlyweds). The "tie" is just that - a 1940s cravat mounted to show off my collection of tie bars. 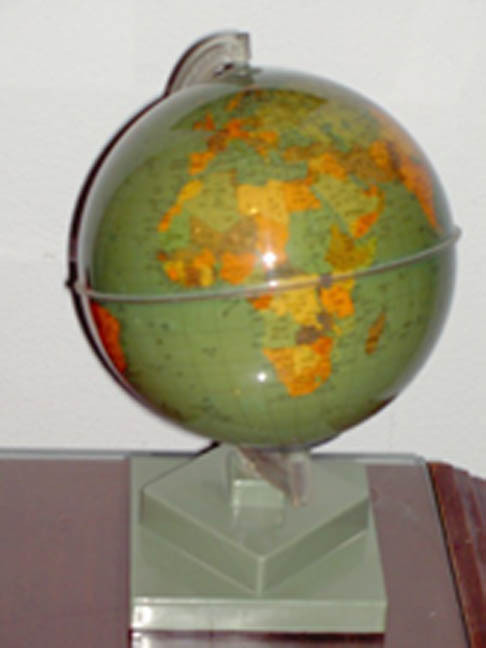 The watches (in globes) are on our Clocks and Watches Page. In the Chest of Drawers photo, the Sailor Bank is on our Knicknacks Page. The Perivale Clock is on our Clocks and Watches Page. 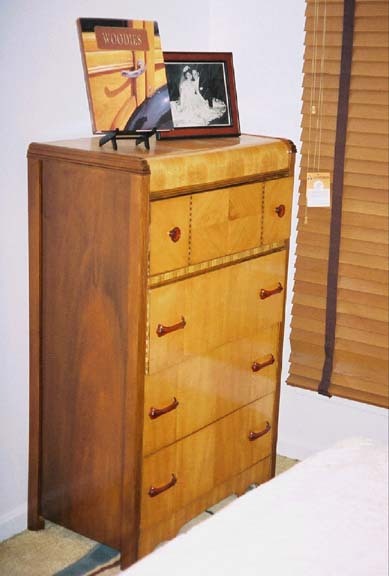 At the top left, rear of the dresser is a "3-D" photo of Niagara Falls, another popular but inexpensive tourist destination in the 1940s. Click Here to learn more about the Cavlier Cedar Chest at the foot of the bed. Above the bed is a montage of family photos. I am especially proud of the little fabric headboard lamp that we found in Syracuse. 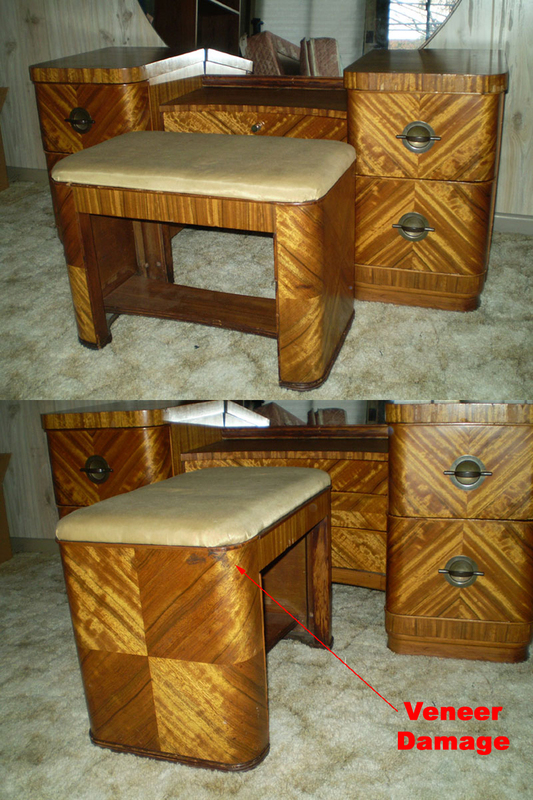 The nightstand is from another set and has some unusual details. 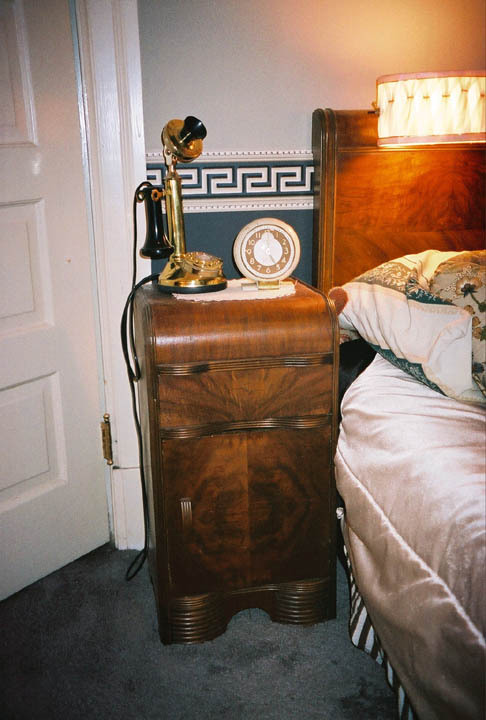 The WE-200 telephone is on our Telephone Page. The Big Ben clock (designed by Henry Dreyfuss) is on our Clocks and Watches Page. 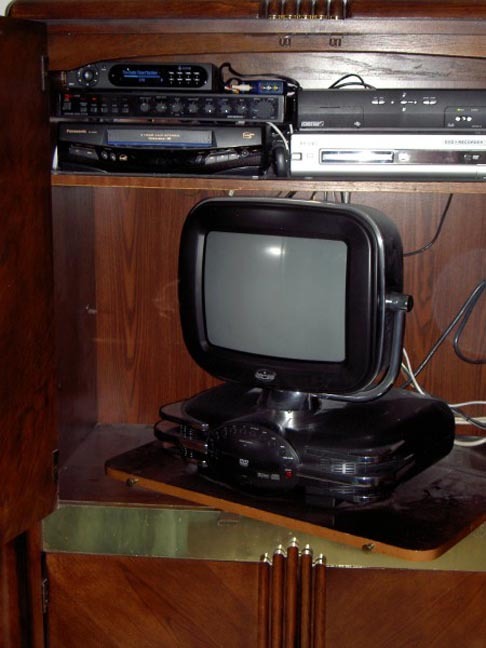 The "Airline" Television (from about 1952) and all its accessories is described on our Televison Page. 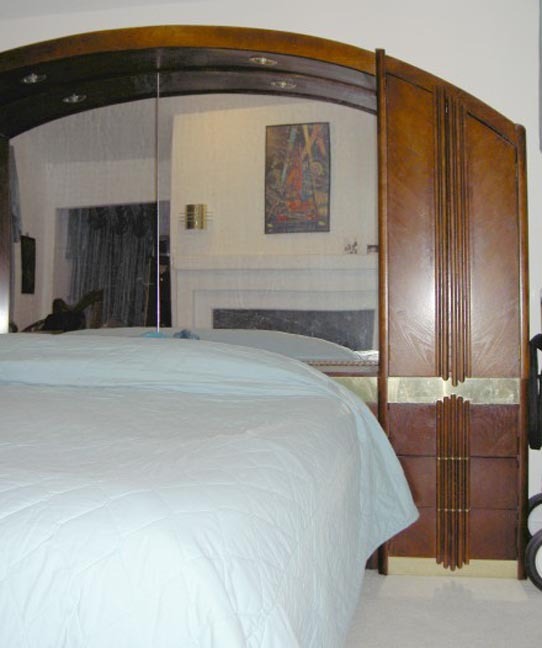 Here is a Blonde waterfall set that I restored for Karyn's guest room. We toned the finish to coordinate with the wood slat venetian blinds. The handles are all Bakelite. 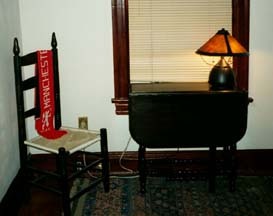 We were very fortunate to get the Vanity Bench! 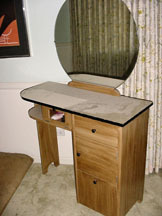 Displayed on the Vanity is a Dresser Set was our first E-Bay Purchase. We found the Rug on a street corner in the District! The Bird Pictures are made of feathers and are a 1940s icon. We got the little headboard lamp from Carl Kirtley. We sanded it down, rewired it and enameled it. "... 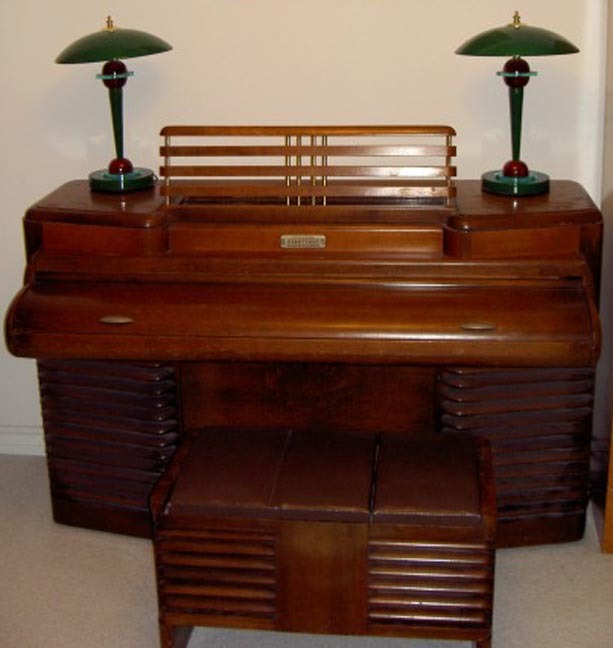 I came across your site while trying to research Art Deco furniture. I've attached some photos of some of the pieces I've found and rather cheaply! There was a used furniture store nearby which has since closed. He wanted to get rid of all his inventory so I got some great deals! 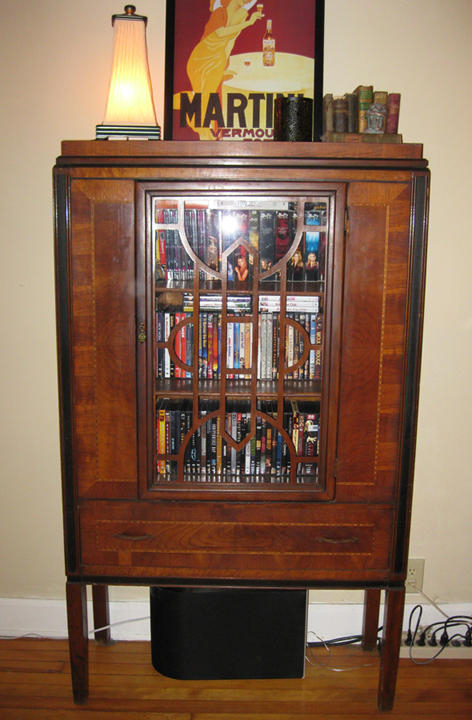 The china cabinet is probably my favorite... 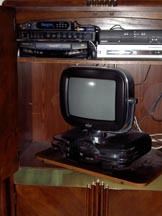 I use it as a media cabinet in my living room. I got it for $85 - which I think is a steal! It's in great condition and I love it! The buffet I got for $116 delivered - it's fairly rough, but cleaned up well and all the drawers and doors work perfectly. I got the bedroom vanity (which is in pretty bad shape, but I still love it) for $65, the bed (including foot board,head board, and rails) one nightstand for a total of $45. 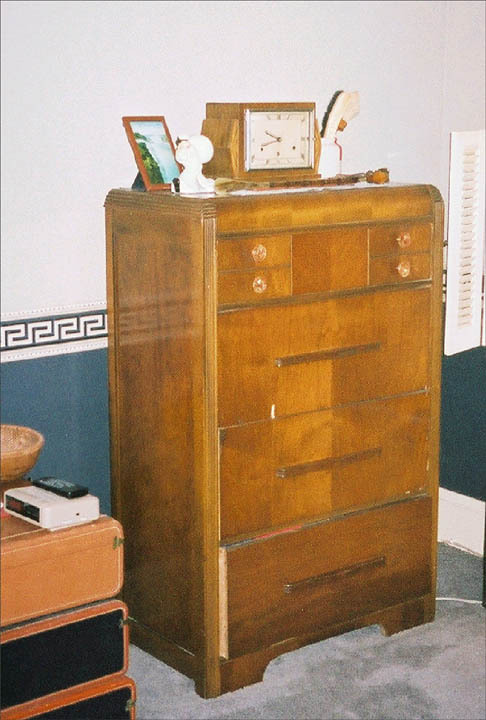 Dresser 1 is probably the nicest one of my collection. It even has hidden panels in the back for secret storage. I found it on Craig's List for $70. The remaining dresser and nightstand came together for about $100 total (also a Craig's List find). The cedar chest is Roos and was also found on Craig's List for $100. It's in excellent condition and still has the labeling in the lid. The vanity bench was a lucky find on Craig's List also and was $30 - it had already been re-upholstered and appears in about perfect condition for a piece of its age. ! 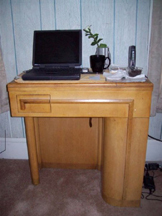 ..."
"... Do you believe I got this piece from the Salvation Army for only $99? All I had to do was clean it and polish, and just look? 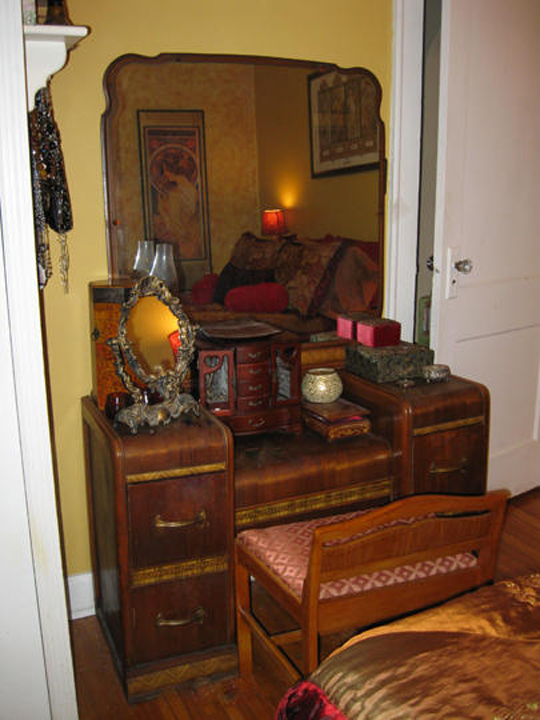 I also got the dresser with a round mirror...."
We think that Diane got a very good deal! "... A friend of mine moved suddenly to Hawaii and left this vanity for me to sell. I understand you don't give appraisals but can you tell me a little about this? She said it was made in 1932. She had moved it all across the country and back so finally the original mirror broke. She replaced it as best she could ..."
This is a very nice waterfall vanity, probably from the mid 1930s. The bookmatch veneer took a lot of skilled labor. Without a close inspection, I can't tell if the exterior is wood veneer or cleverly printed paper. 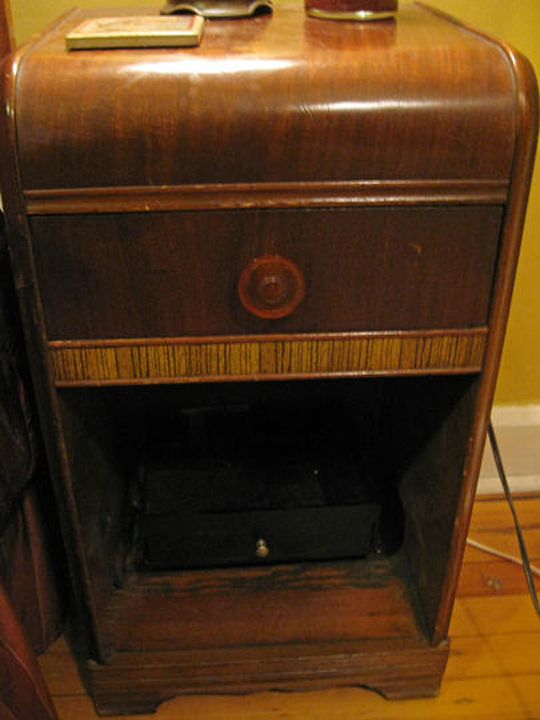 Some manufacturers used this shortcut -- and almost all Philco radios of the 1930s have a paper exterior rather than wood veneer. Paper or wood, there is some damage -- nothing, however that appears to be irreparable. 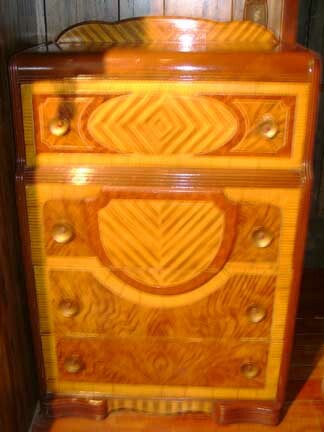 The drawer pulls have a nice design and really add to the piece. 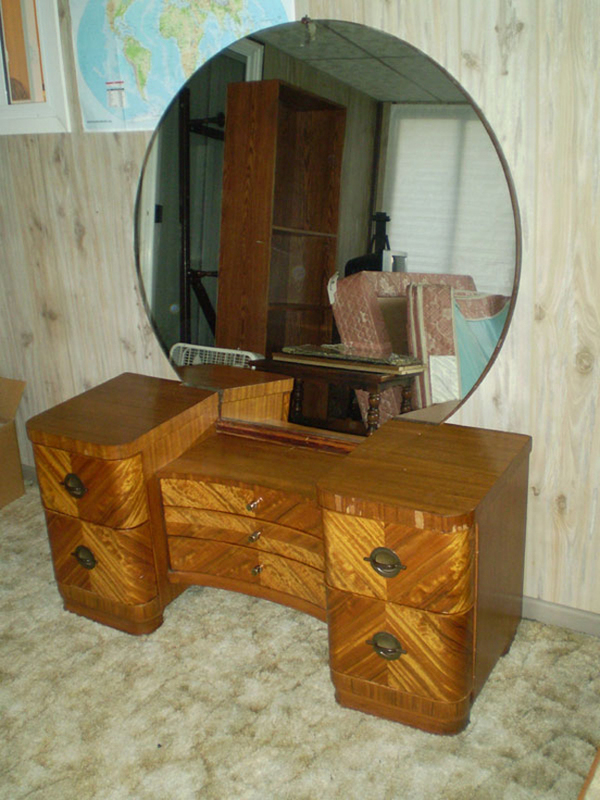 It is VERY HARD to find the matching vanity bench, something that would be a real plus for this set. 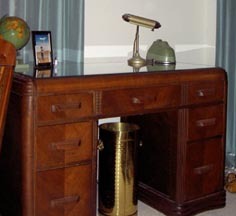 At the Left is Paul's late 1930s waterfall writing desk (finished front and back for different room configurations) Note the matching electric pencil sharpener and globe In the Center is a 1930s Shanghai sunburst chest with two-tone relief. On the right is the 1936 Encyclopaedia Britannica and it's matching streamlined case with two-tone finish. To the left of the desk are Paul's Harps. 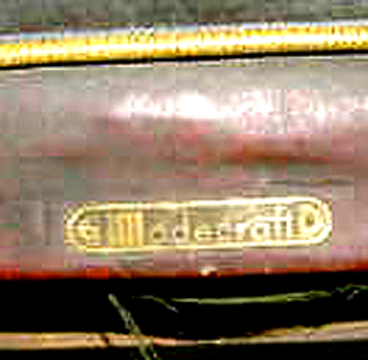 The Clark Irish Harp is locked into its folding taborette. 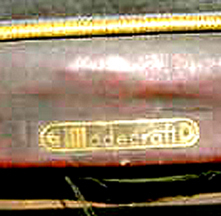 Beside it is a mid 1870s Erard Gothic Harp (French factory). The Clark was made from 1915 to the late 1940s and was virtually the only harp of its size sold in the United States at the time. 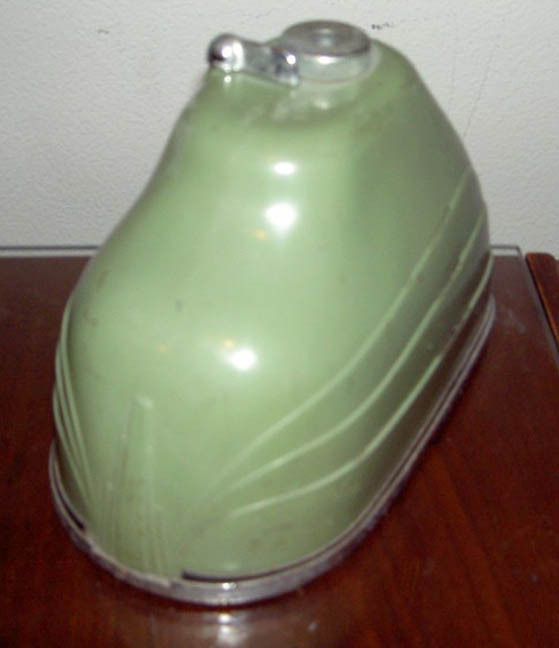 It was made by the Melville Clark company until the 1920s, when the Lyon and Healy Company took on the Clark Company's manufacturing. 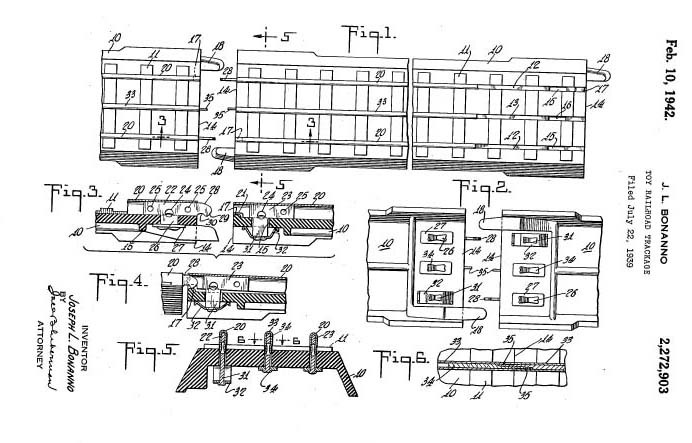 In the late 1930s, Lyon and Healy had too much demand for pedal harps and shifted manufacturing back to Clark. 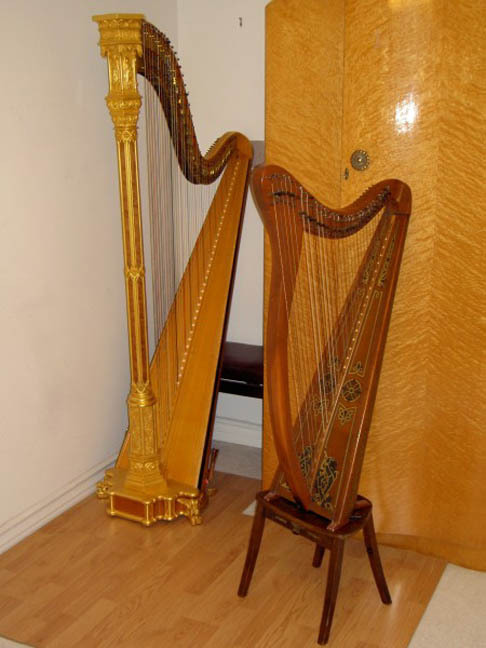 Lyon and Healy lever harps are available with the same soundboard decal to this day. The Clark has a lighter tension and thinner soundboard compared to almost all harps of its size made today. It's very resonant, and its timbre is comparable to an early 20th century pedal harp. Paul says, "It's a joy to play, but it's fragile, which makes it a bit scary to tune. Even a small harp like the Clark has 1,000 lbs of string tension pulling on its soundboard and neck. 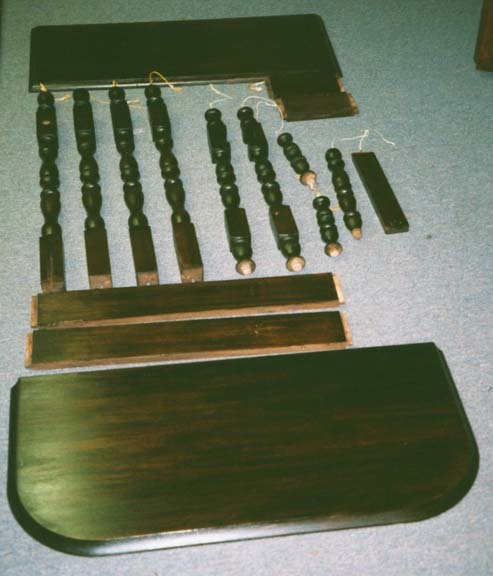 In the 19th century, pedal harps like the Erard Gothic were as common in people's homes as pianos are today. The Clark would be the most likely newly purchased harp to find its way into the average American home of the 1930s-1940s due to its size and price..."
Entertainment was definitely a subject for Waterfall. 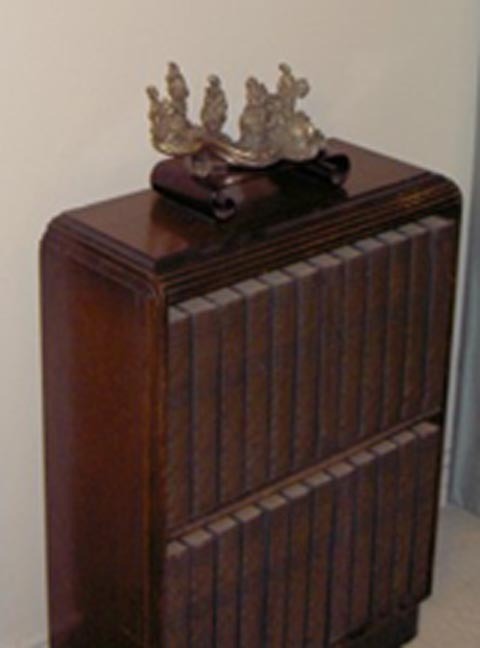 On the Left is Paul's late 1940s Streamline Moderne Speaker Cabinet along with a mid 1960s speaker and Edcor stereo-to-mono converter. 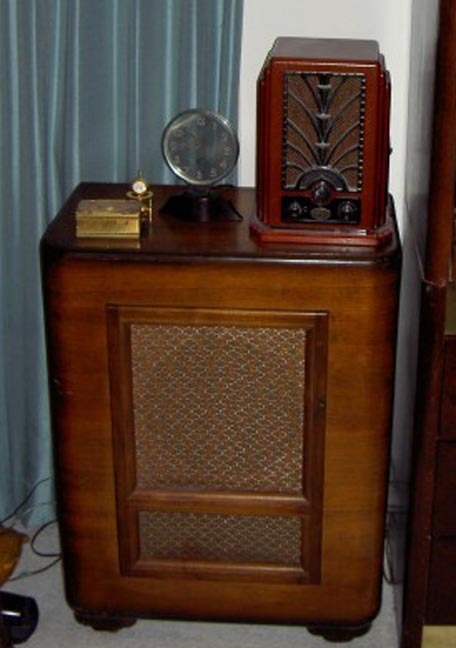 Check out the Rex-Cole Model 5-A (shown on the speaker) in our Vintage Clocks Page. 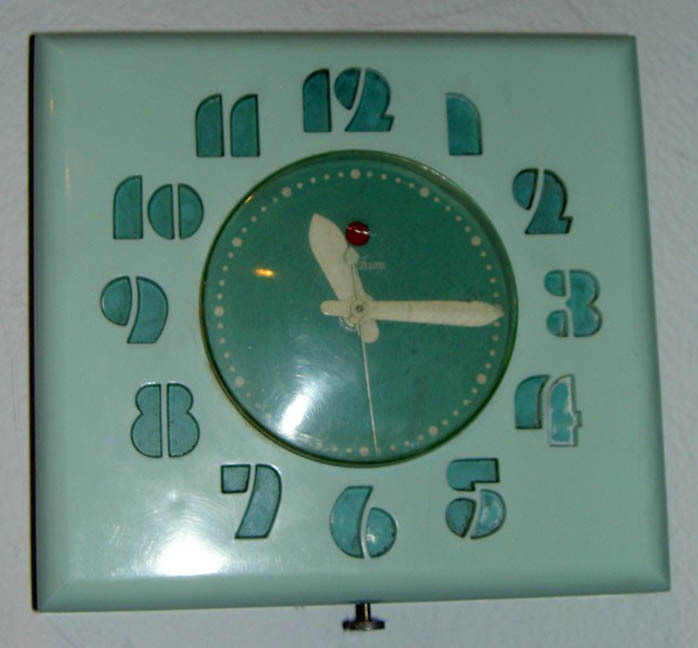 [NOTE: this was made by the same manufacturer as our Etalage-Reclame clock using a Bakelite base.] The interior of the armoire (right) is a bit more modern. 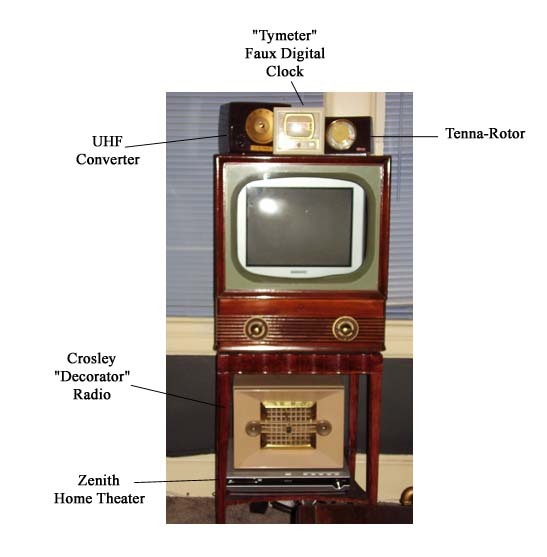 Note the Omnifi digital streamer at top left (for picking up 1930s and 1940s internet radio stations). 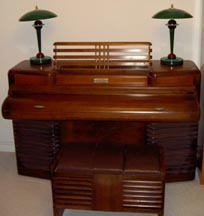 Here is a picture of the Storytone piano at the 1939 World's Fair as well as a Storytone in Paul's home. This is an extremely rare and historically important instrument. The Storytone piano was built in 1939 in a joint venture between Story and Clark and RCA - the piano has normal strings and action but no soundboard - the sound is amplified by pickups and a speaker system making it the world's first practical electric piano. The sound is very beautiful considering its design during the infancy of amplified instruments. 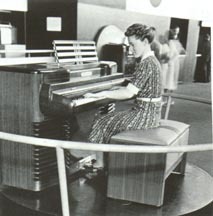 The Storytone Piano was made famous by artist Earl Hines. 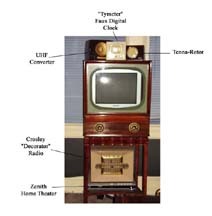 Check out our Vintage Television Page to see photos of the matching Television (The RCA TRK-9) that went with the Storytone Piano to make the "complete" home entertainment center of the late 1930s. 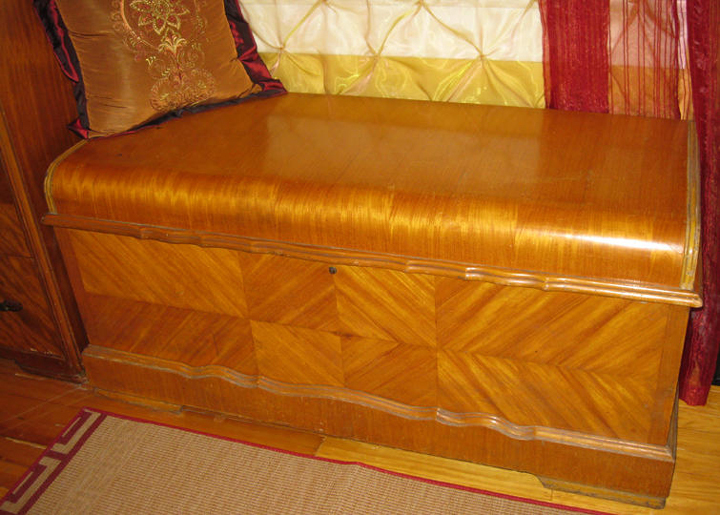 Click here to look at another type of collectible, or keep on scrolling for more Furniture. 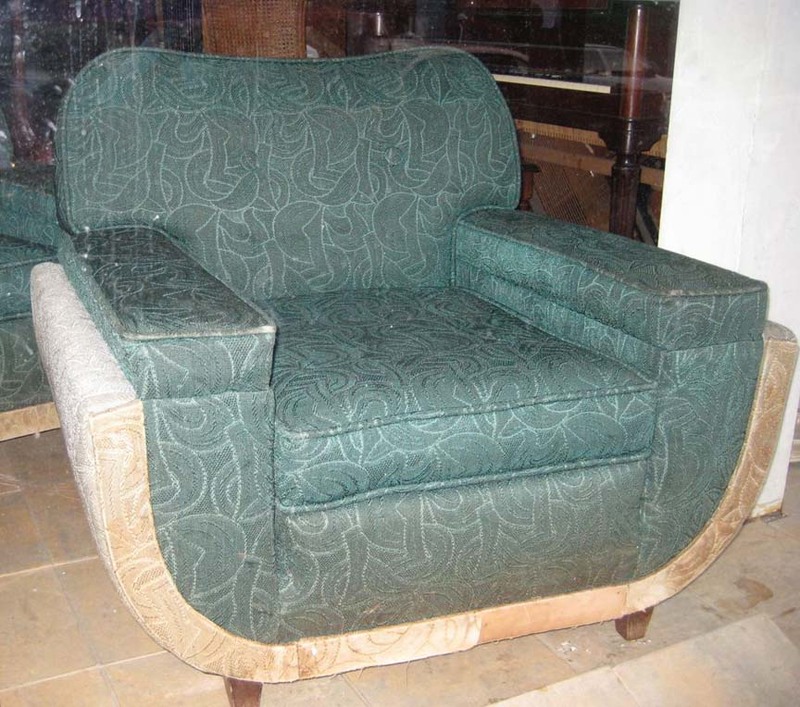 These were the zenith of the Upholsterer's art, combining shape and texture into a breathtaking whole. Those of you who are into re-covering will note that these chairs have (effectively) an outside back on the bottom. There is a lot of work in these pieces. 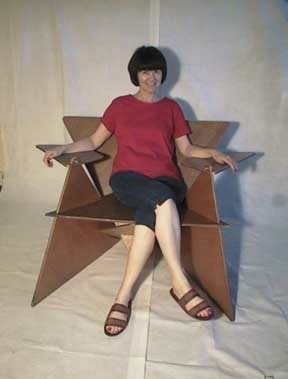 These chairs are unusually comfortable. Click Here to see more of Dave's Chair. 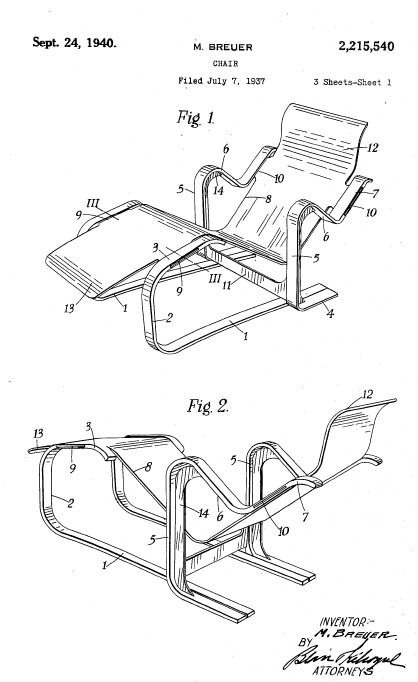 Here is a patent diagram of a concept developed by Alfred DeMartini in 1953. 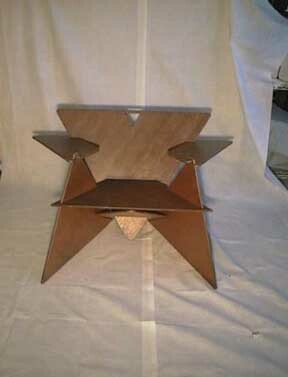 It shows how you can manufacture a table and two chairs out of one sheet of plywood! You can beat IKEA -- all you need is a jigsaw, a drill and one sheet of plywood -- just lay out the pattern shown above, cut and assemble. You might have to do a little sanding and staining, but who's going to complain about a table and two chairs for less than $50 - even less if you use utility plywood and paint it a solid color. Here are some other items from my office. 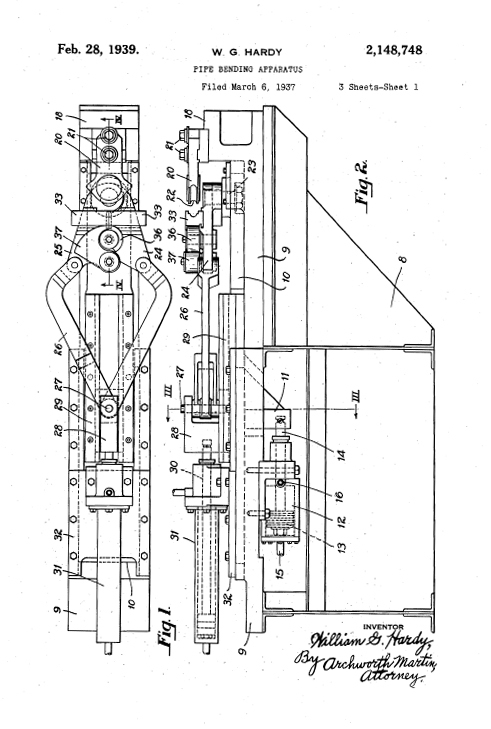 You might be interested to learn that the unusal system of tracks used by Lionel Trains was invented by Mr. Joseph L. Bonanno of Maplewood, New Jersey in 1939. 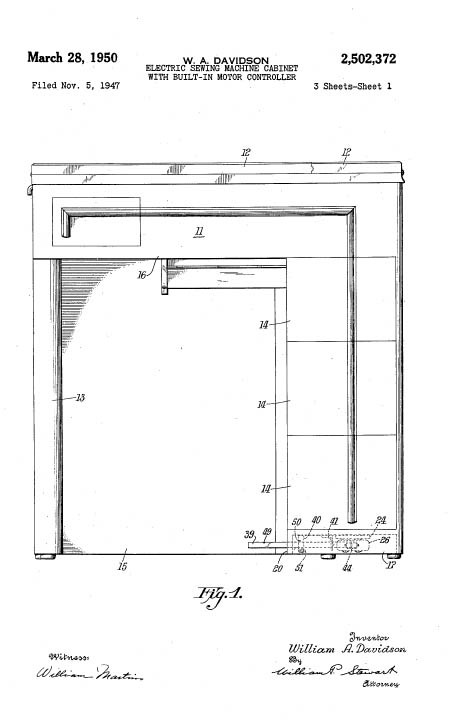 His patent was granted on February 10, 1942. 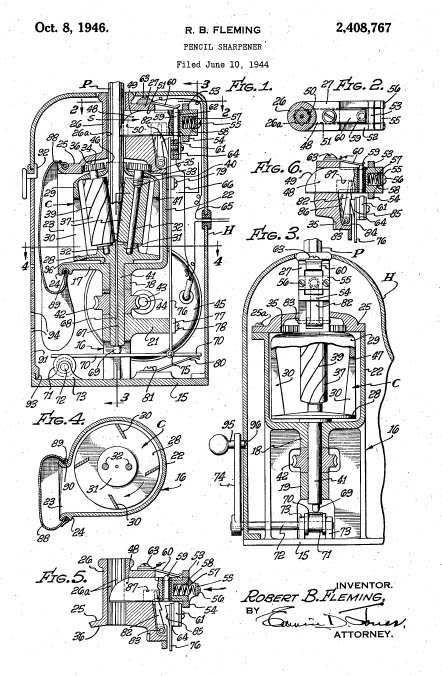 Mr. Bonnano also invented the famous Operating Milk Car that entertained legions of children. (You can watch a video of this fascinating toy on YouTube. 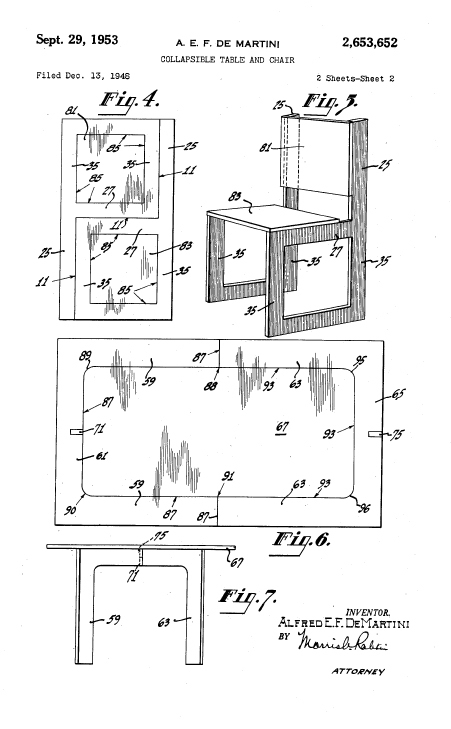 Mr. Bonnano received Patent No. 2,664,664 for his pioneering work. Keep that in mind the next time you need a sparkling tidbit to enliven an otherwise dull conversation. 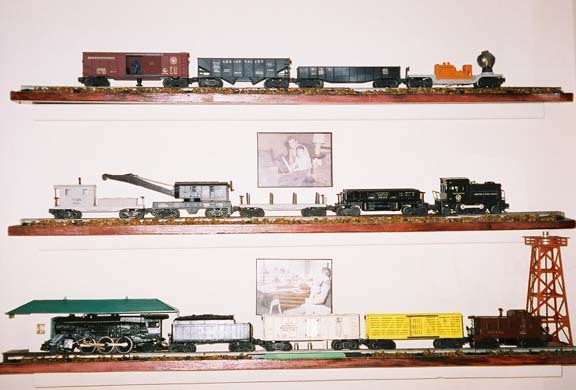 You might want to look at our Streamlined Locomotives Page to see more of our model trains. 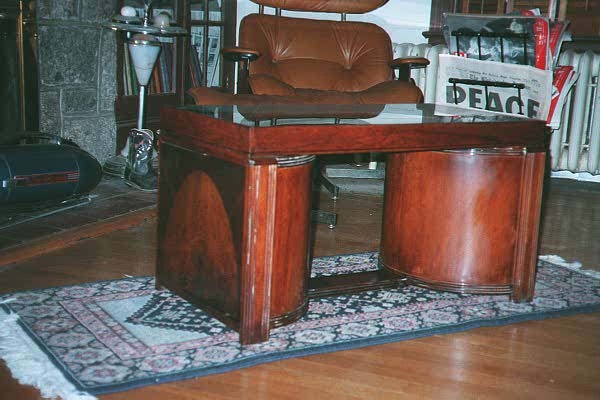 I got the Globe-Wernicke sectional bookcases for about $5 each in 1965. They are worth a whole lot more now... These are "Universal 13 inch units", pattern 813 quality 289 1/2. They were made in Cincinnatti, Ohio in the 1920s. History: An American businessman Henry C. Yeiser set up a furniture factory called The Globe Files Co in Cincinnati in 1882. The factory started manufacturing office and filing furniture. 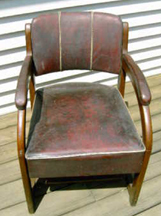 In about the same time, a furniture factory called The Wernicke Co was set up in Grand Rapids, Michigan. 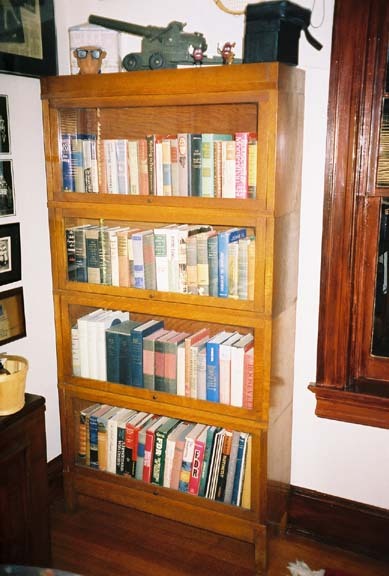 A few years later The Wernicke Co designed a bookcase, which consisted of different sized glass cabinet components. By stacking these components on top of and beside one another, you could create different wholes. 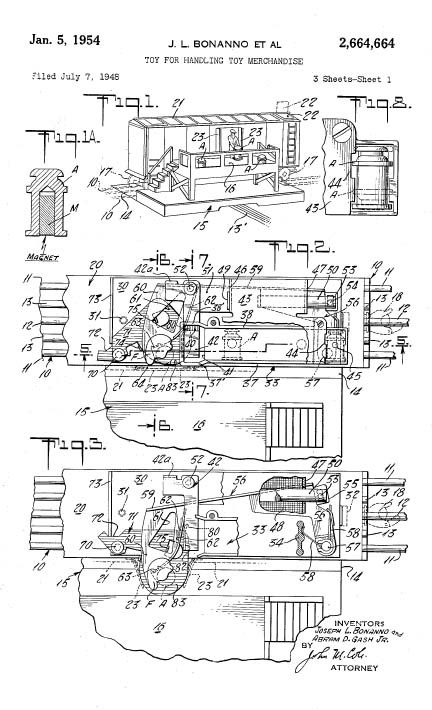 Henry C. Yeiser got interested in this design and bought The Wernicke Co factory. With the new owner, the factory was renamed The Globe Wernicke Co. 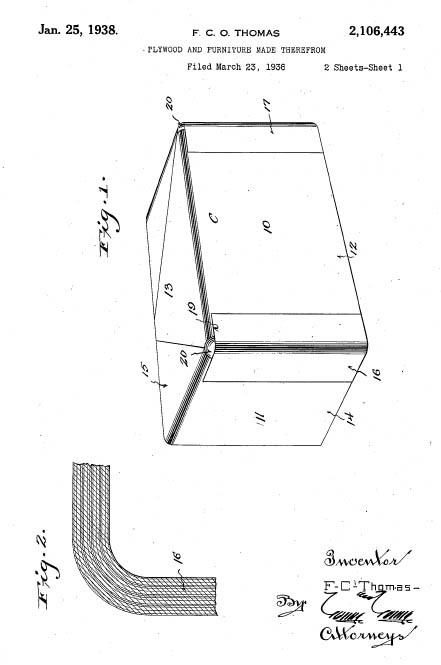 In December 1892 Henry C. Yeiser patented this unique bookcase design. 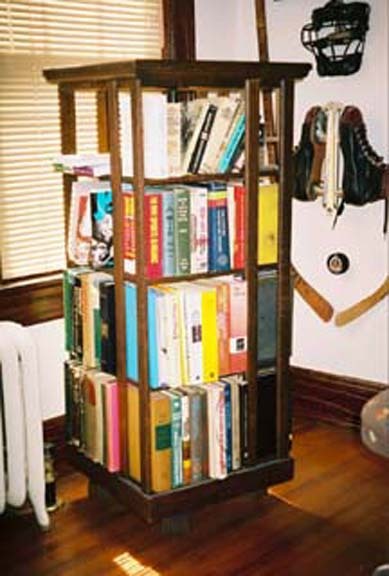 This bookcase design was a huge success and aroused great interest also in Europe. By the end of the 19th century, an English furniture manufacturer Thomas Turner started marketing the design in England. 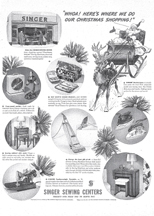 The company was named The Globe Wernicke Co Ltd. 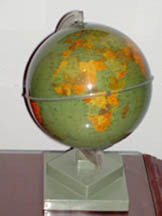 In time, The Globe Wernicke Co also expanded to Canada, France, Belgium and Austria. 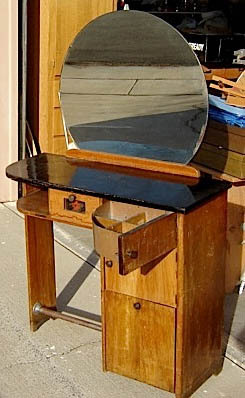 Another Lucky Find: This mahogany mirror was included in the pile with the Gate leg Table and the Rocker. This was a fairly straightforward restoration, although I had to use an epoxy-based wood filler to repair some structural damage. It makes a Wonderful hall mirror. 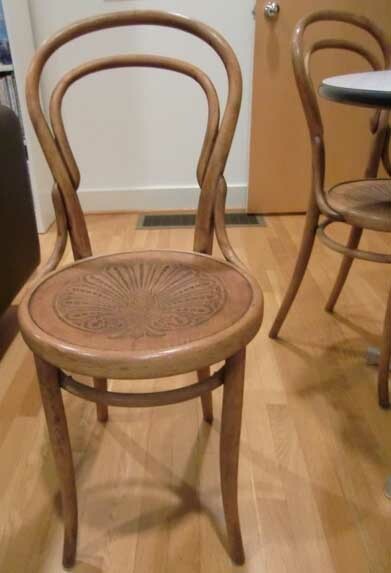 This is a Thonet Bentwood chair made in Czechoslovakia and imported by the Astra Bentwood Company. This is the bottom of the line for bentwood chairs. I got five of these for $5 from a bookie in Pittsburgh in 1966. He said "Take as many as you want --- we keep 'em here in case we get raided --- it's nobody's loss" Check out real Astra Bentwoods on e-bay today... 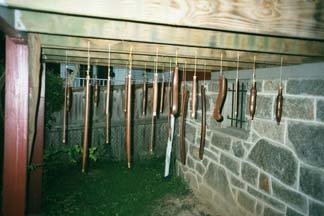 The wood is beech that has been steam-bent. The finish is a mixture of lampblack and milk, and it wears to a wonderful aubergne color. 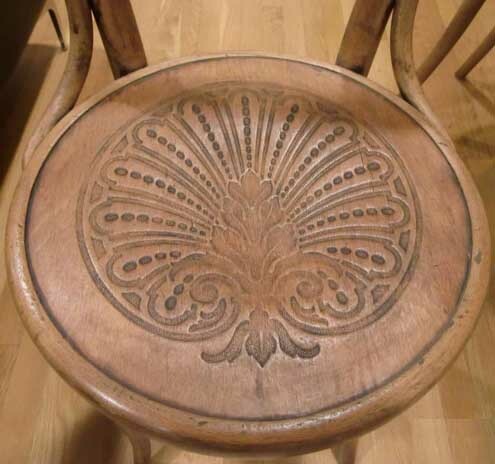 Click Here to learn more about Thonet Bentwood Furniture. 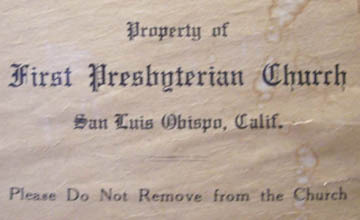 Our friend Richard had a similar experience in buying Thonet/Astra bentwood chairs, but the seller was diametrically opposite -- it was the First Presbyterian Church of San Luis Obispo (CA). Richard writes: "... These chairs were purchased in the early 1960's. Price $5.00 each. 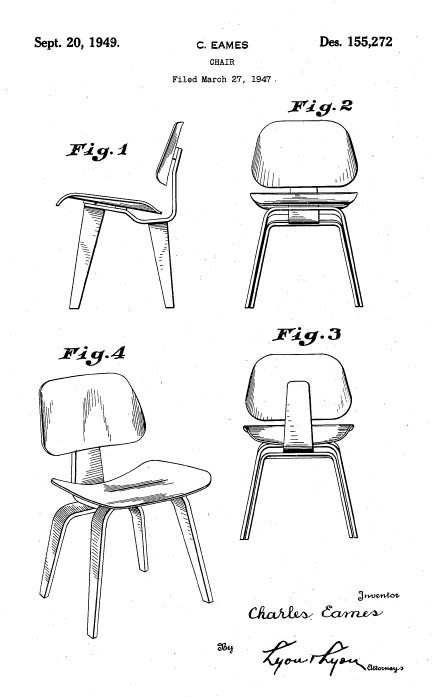 They were Imported by Astra Bentwood Furniture Co., New York. 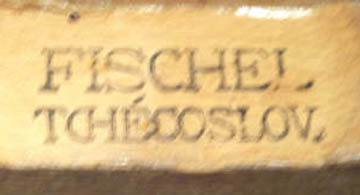 Some of the chairs have the Fischel Tchescoslou stamps on the chairs ..."
The "Czechoslovak State" was an early name for Czechoslovakia, probably during the 1920s. Czechoslovakia was founded in October 1918 as one of the successor states of Austria-Hungary at the end of World War I. It consisted of the present-day territories of the Czech Republic, Slovakia and Carpathian Ruthenia. Its territory included some of the most industrialized regions of the former Austria-Hungary and is a logical origin for mass-produced furniture. 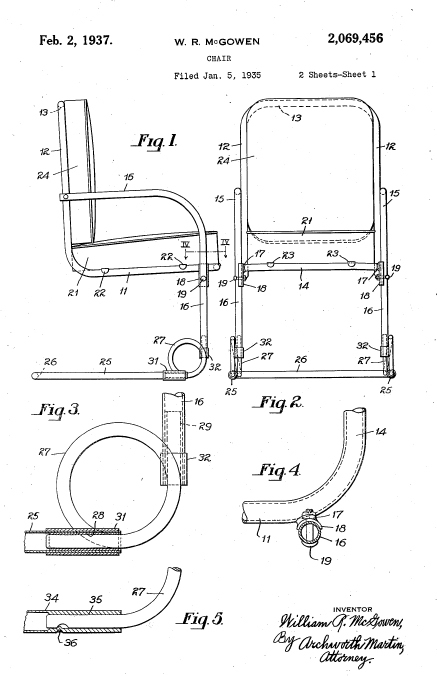 The company was founded by David Gabriel Fischel one month after the �patent� granted to Thonet expired. Fischel, a vegetable oil salesman from Prague, opened his business on June 10 1871 and placed it in the hands of his eldest son Alexander Fischel who had worked for Thonet for many years at their Koritschan factory. At Niemes, a smalltown in the most industrial part of the Danube region, the Fischel factory employed 100 workers and produced 100 units per day. 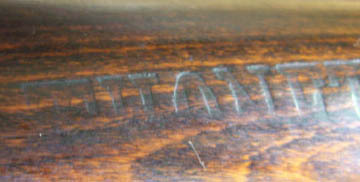 According to the Thonet Website, the label on Richard's chairs dates to the 1920s. 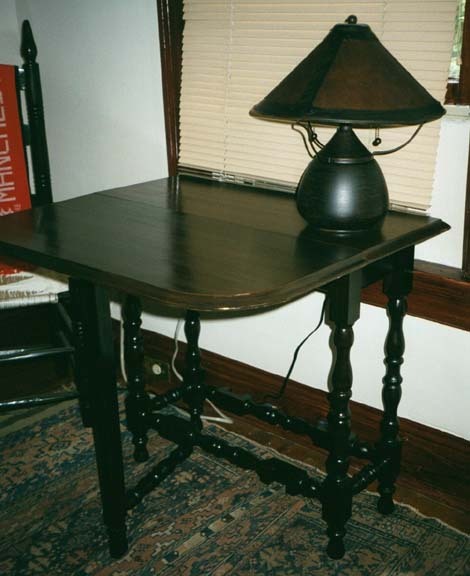 Richard also has this to say about his lovely Thonet table: "... We purchased the table in McMinnville, Oregon $75.00 great price. (ed: NO Kidding!!) It has the Thonet stamp on one of the legs. It is 27 inch high and 18 1/4 inch dia. ..."
Czechoslovakia: J & J Kohn, "MUNDUS"
Poland: Look for the abbreviation "ZBM" ["Zaklady Przemyslu Meblowego"] means "Furniture Industry Plant Mazowia". Mazowia is a county/province in Poland and the town is Radomsko, the capitol of the Polish Wood Industry. Beautiful furniture is still being made there. 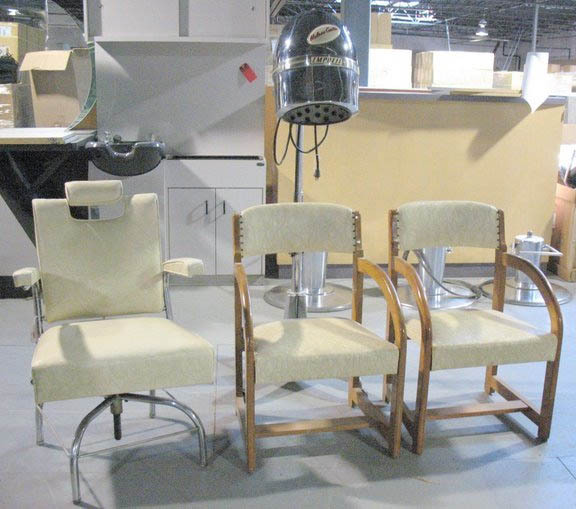 Our friend Richard sent us some photos of some J & J Kohn chairs that he had found, and we believe that he has some of the very nice Austrian chairs. Unfortunately, in these days of Photoshop and high-resolution scanners, antique dealers have been known to counterfeit labels to upgrade mass-market pieces to higher grade. Check the label carefully. 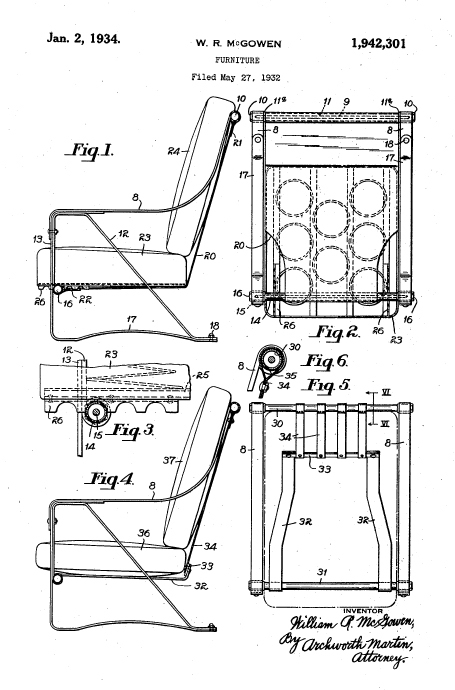 Even though the Company and trademark may have been in Vienna ("Wien") the chairs could have been cranked out in Poland. Look for the ZBM woodburned some place on thepiece. 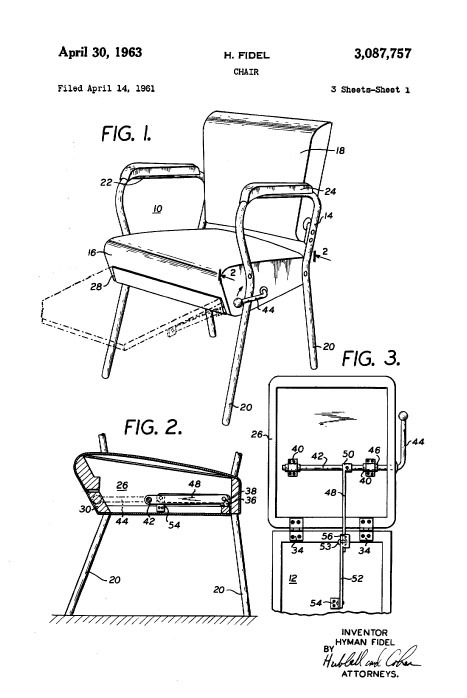 Also, the Thonet company purchased these chairs and imported them into the USA, so it is also possible to see Thonet labels in conjunction with the various J & J Kohn labels. On a trip to Brunswick, Maryland, we found this Singer sewing machine. The interesting thing is that it has an Art Deco inspired case. 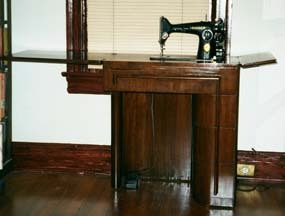 I paid $39 for it --- and it included all the Singer accessories, including the Buttonholer and the Curtain Pleater. As is generally the case, the Singer machine still works perfectly. 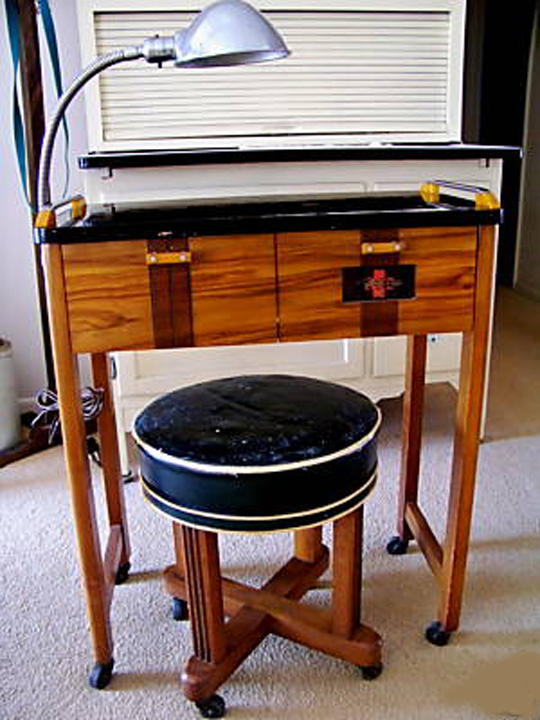 In the 1930s and 1940s, the Singer company made things that lasted forever! 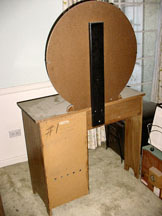 The second photo shows the machine ready for use, with the fold-out work surfaces extended. 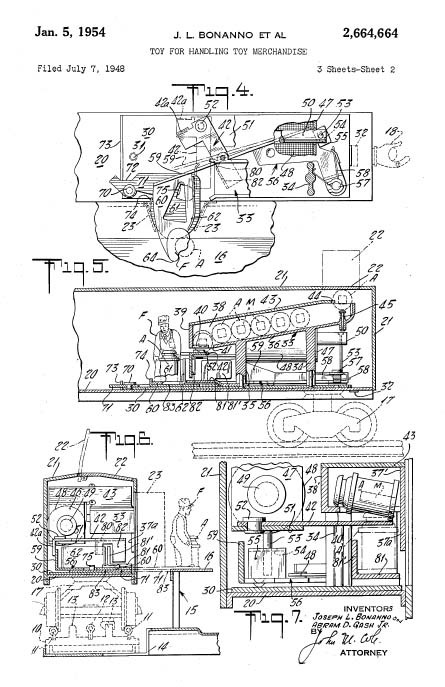 Several clever spring arrangements bring out arms to support the extensions and the machine itself is ingeniously counterweighted. We want to thank our reader Gunther for sending in this photo. I take "before" pictures because a lot of people just can't comprehend that so much good stuff is just lying there for free on Bulk Trash Day. Well, there are Bulk Trash days and then there are BULK TRASH days. One morning in May, 2001, I hit the jackpot! 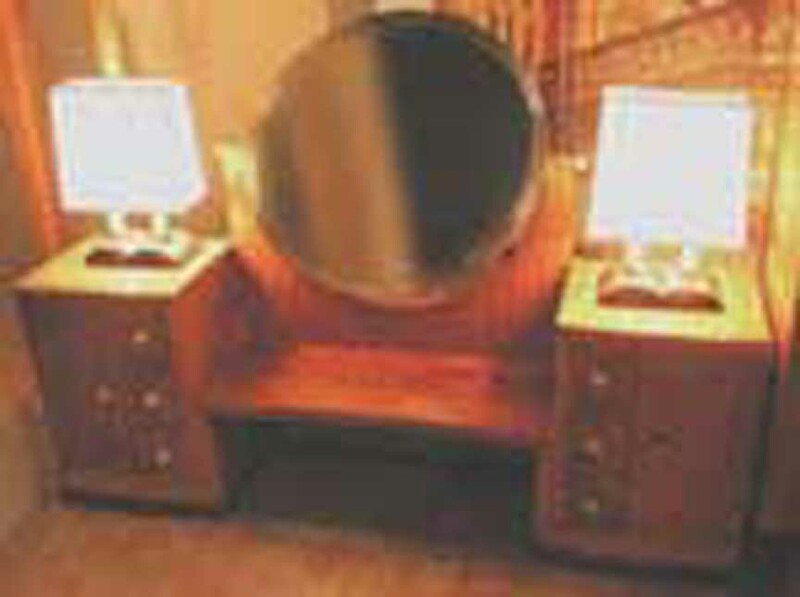 This Windsor-style rocker, the Gate Leg Table and the Hall Mirror were all found at the same time. Repeat --- they were all free. 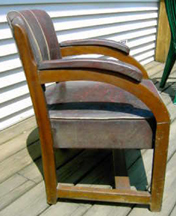 The seat is the most important part of a Windsor-style chair, because all the other parts fit into it. In a true Windsor-style chair, the seat is formed from one large block of wood. In this case, it would require a single slab of oak about two feet square and three inches thick. (a VERY expensive prospect) The factory that manufactured this chair (my guess is that it dates from the 1920s) made a laminated seat by gluing together a dozen small strips of oak; this size stock that is much more available and economic. The factory used a tongue and groove joint, and held the strips together with a casein type glue, most likely made from animal hides. The entire chair was covered with thin mud. 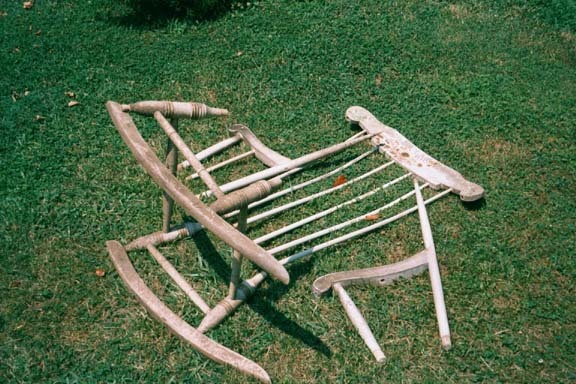 It looked like the chair had been left outdoors for some time, probably on a porch or patio somewhere. It looks like water had swelled the wood, opening the seams on the laminated seat. 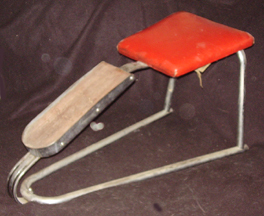 Eventually, the glue deteriorated aaaand the components of the seat fell apart, taking with them parts of the chair. However, all 12 parts were right there with their tongues and grooves intact. All I had to do was remove the glue residue, apply a much stronger epoxy glue, and clamp the assembly back together. For safety sake, I bored four 1/4 inch holes through the entire width of the chair and inserted dowels. 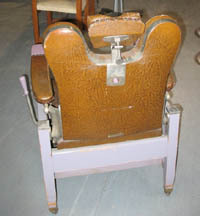 The second photo shows the process of putting the seat back together. 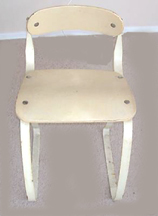 The chair had been painted white at some time, probably as part of somebody's "brightening" campaign back when magazines like Good Housekeeping urged women to "brighten up Grannie's old rocker by painiting it dazzling white" (or some such nonsense). Needless to say, it was impossible to salvage the old finish, so I got out the heat gun and took the thing down to bare wood. An epoxy-based wood filler was used to repair damages and fill the seams. 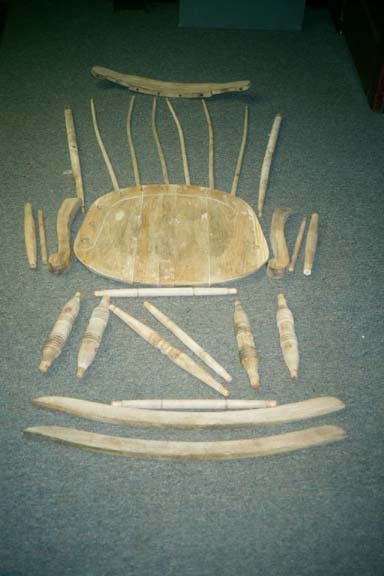 The pieces were sanded with three grades of paper, 60, 100, and 150. The wood was carefully cleaned with naphtha, a petroleum derivative that removes grease but won't raise the grain. 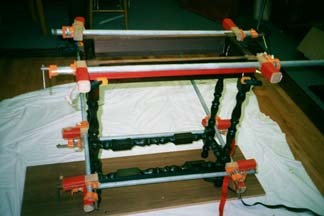 The fourth picture shows the various pieces being stained. Actually, several things went on. 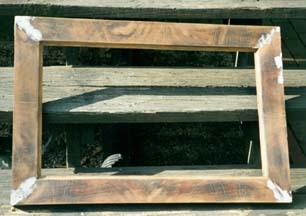 First, a thin coat of shellac was applied to seal the wood. 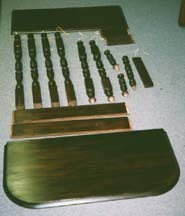 Then, several coats of water-borne gel stain (Rosewood) were applied. Then, the pieces were sanded with 200 grit paper and a thin coat of shellac (alcohol solvent) was applied over the stain to serve as an inter-face between the stain and the glaze coats, keeping one from dissolving into the other. For this piece, the "glaze" was clear water-borne urethane with several drops of pigment added; red, yellow, and brown glaze coats were added and each glaze coat was wet-sanded. Four coats of clear urethane completed the finishing --- the first two were wet-sanded with synthetic steel wool, the third was rubbed with #0000 steel wool and the final coat was treated with Auto Rubbing Compound. The finished product is shown in the last picture. It is a very comfortable addition to my office. This is a vey nice dark mahogany gate leg table. As found, there were several problems. First, one of the two leaves was missing as was the actual gate leg. Next, there was an enormous round stain on the center, indicating that a leaky flower pot had probably resided there. On the other hand,the thing was solid mahogany and seemed eminently restorable. Once again, the glue in the joints had deteriorated and the entire structure was quite rickety. Thus, it was necessary to disassemble the table into its component pieces. The center panel and leaf had incurred considerable damage, so they had to be reduced to bare wood. The table frame was in much better shape and needed only a light sanding. 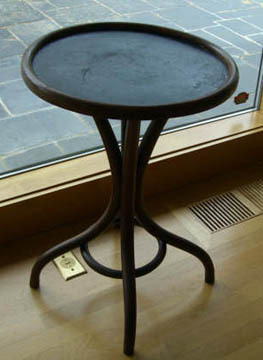 The table was glazed with spar varnish mixed with pigment (Iron Oxide and Van Dyke Brown, in separate coats). Each glazing was allowed to dry for a week and wet-sanded. A final clear coat was applied and buffed with #0000 synthetic steel wool and auto rubbing compound. Yes, the table required about two months of wall time to complete, although each individual work session was only about half an hour. 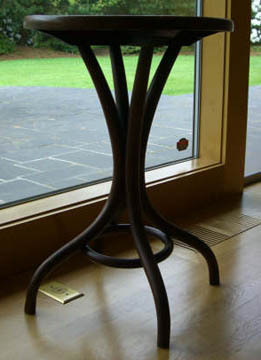 I had to fabricate a Gate leg --- a piece of mahogany from my "remnants" pile was pressed into service, proving that it is valuable to scavenge wood furniture even when it cannot be restored. The last photo shows the table in service in my office. The table now holds a Bean Pot lamp with a mica shade that I picked up at a church thrift store for a few bucks. It required only minor re-wiring. The recruiting poster ("Gee! I wish I were a man..") by Howard Chandler Christy is an original. My mother's father took it down on the day World War I ended. He kept it and left it for me. I have always admired the young lady's use of the subjunctive. 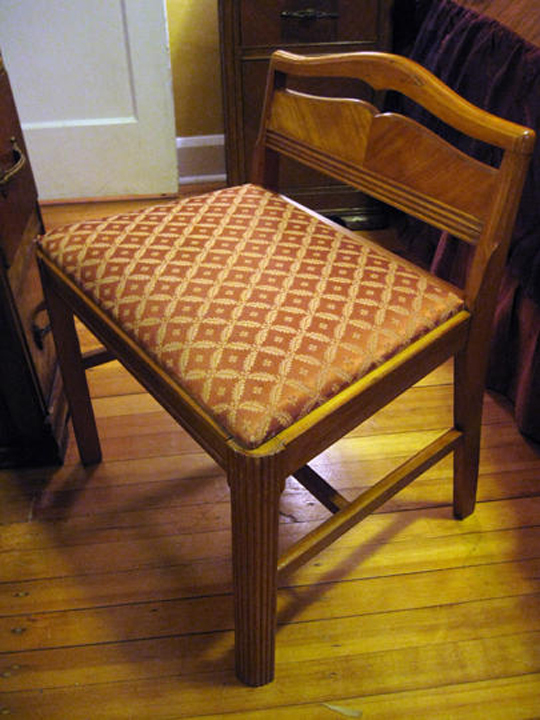 I bought this kitchen chair in Frederick, Maryland for about $5. It was painted red and white. When I got it down to the bare wood, it appeared that this was the original color scheme. This has lines that remind me of stuff by Frank Lloyd Wright. I don't have any more provenance, but I really like it! 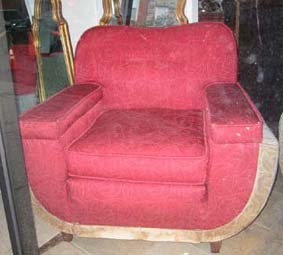 A chair that looked like a potato chip. Another that resembled a "well-used first baseman's mitt." A folding screen that rippled... With a grand sense of adventure, Charles and Ray Eames turned their curiosity and boundless enthusiasm into creations that established them as a truly great husband-and-wife design team. Their unique synergy led to a whole new look in furniture. Lean and modern. Playful and functional. Sleek, sophisticated, and beautifully simple. 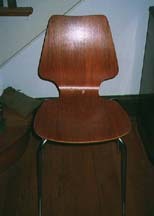 That was and is the "Eames look." That look and their relationship with Herman Miller started with molded plywood chairs in the late 1940s and includes the world-renowned Eames lounge chair, now in the permanent collection of the Museum of Modern Art in New York. Charles and Ray achieved their monumental success by approaching each project the same way: Does it interest and intrigue us? Can we make it better? Will we have "serious fun" doing it? They loved their work, which was a combination of art and science, design and architecture, process and product, style and function. "The details are not details," said Charles. "They make the product." A problem-solver who encouraged experimentation among his staff, Charles once said his dream was "to have people working on useless projects. These have the germ of new concepts." Their own concepts evolved over time, not overnight. 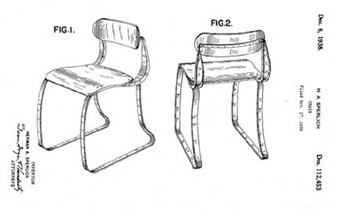 As Charles noted about the development of the molded plywood chair, "Yes, it was a flash of inspiration," he said, "a kind of 30-year flash." 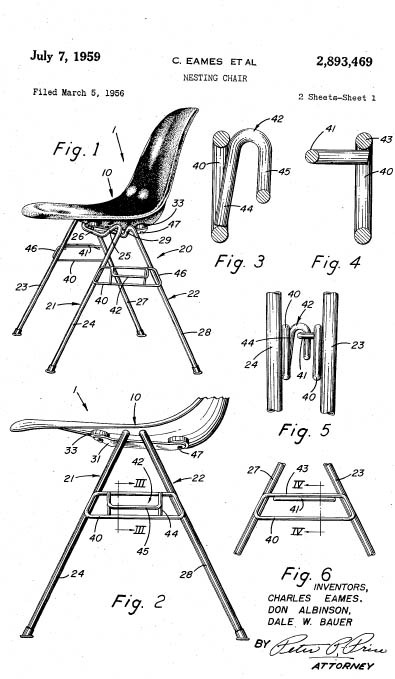 In fact, Eames wor in molded plywood had rather humble origins -- during World War II, he made molded plywood leg splints, as shown below. 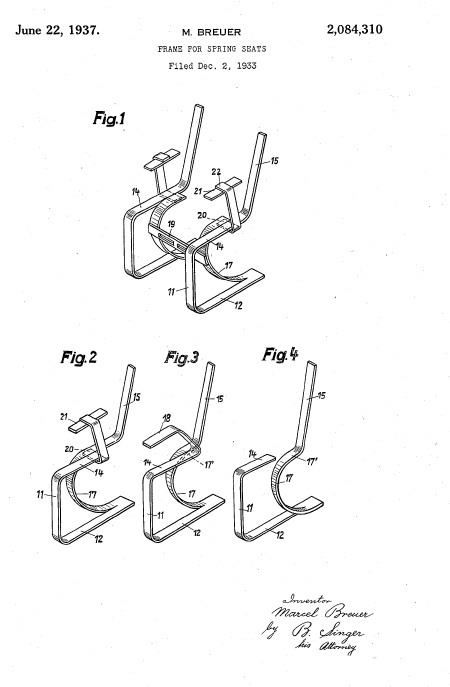 This, in turn led to his famous "Potato Chip Chairs", patented somewhat later. A magazine contest led to their highly innovative "Case Study" house. Their love of photography led to film making, including a huge seven-screen presentation at the Moscow World's Fair in 1959, in a dome designed by their friend and colleague, Buckminster Fuller. Graphic design led to showroom design, toy collecting to toy inventing. And a wooden plank contraption, rigged up by their friend, director Billy Wilder for taking naps, led to their acclaimed chaise design. A design critic once said that this extraordinary couple "just wanted to make the world a better place." That they did. They also made it a lot more interesting. 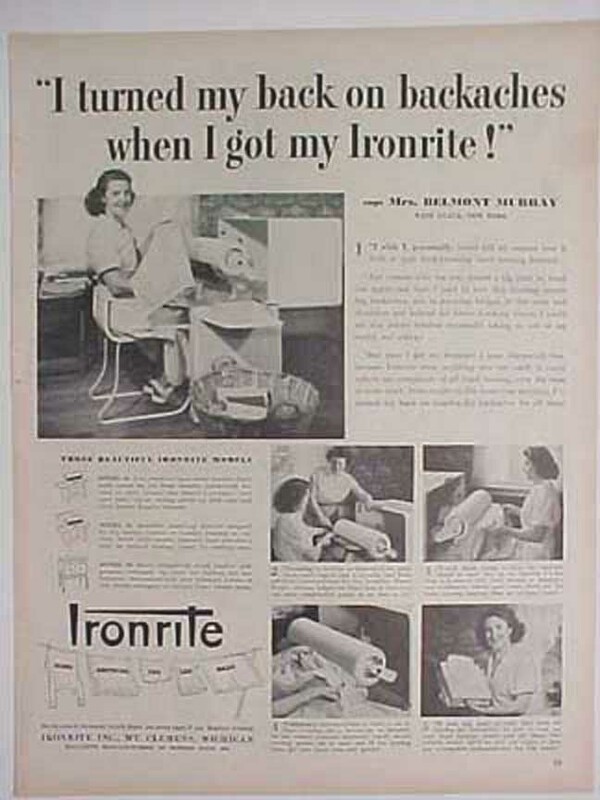 We have a special page all about Ironing and a considerable part of it is devoted to the Ironrite ironing machine, mainly because I have one and use it all the time. 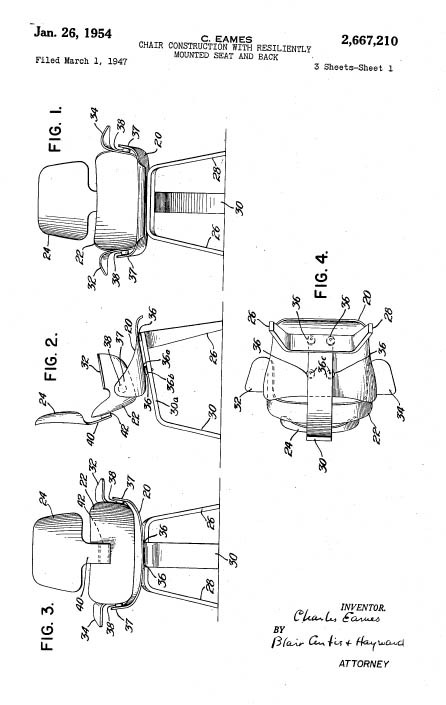 The following is about the chair that was sold as an optional accessory to the machine. Lately, they have become somewhat popular as general seating as well as specific seating before the ironer. 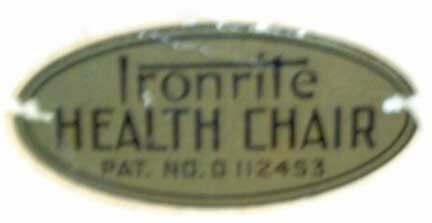 About a month after I found the IronRite machine, I was at an estate sale in Bethesda. 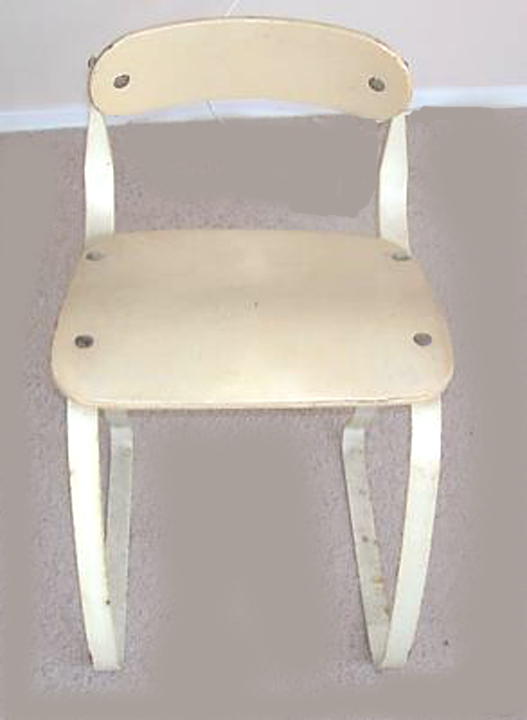 Off in the corner was a beat-up molded plywood chair. Upon examination, I was STUNNED to find that this was an IronRite Health Chair, the official chair that goes with my machine. 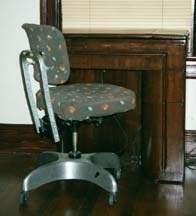 Not only that, it is the appropriate chair for the Model 85! (The later model  featured a chair with a reinforcing splat between the legs...) As you can see, a considerable amount of work was required to get this back in shape. Lord knows what the odds against repeating this feat are.. Well, good things come to those who search. You can't sit in either for very long! This is a shoe salesman's foot stool that I found in Canonsburg, Pa, just south of Pittsburgh. It is interesting in its own right, but it is also part of a wonderful line of chrome-steel furniture that was manufactured by the McKay Company in Pittsburgh. This company is becoming much more collectible, although it is hard to find pieces because output was relatively small and more-or-less limited to the Western Pennsylvania area. 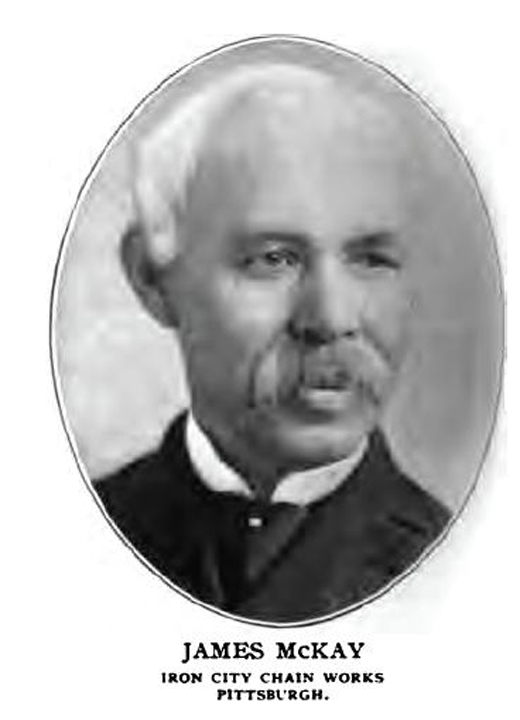 James McKay was born in Ireland in 1830 and emigrated to the United States in 1848. He began as a wholesale grocer, but became became identified with the oil industry during the boom of 1876 in Butler county. He owned "Jenkins Oil Field" that produced about three thousand barrels per day. Looking westward, he purchased the "Yankee Girl Silver Mine". This was one of the largest mines in Colorado. In 1887, he organized firm of James McKay & Company, taking into partnership his two sons, Robert J. and J. Albert. 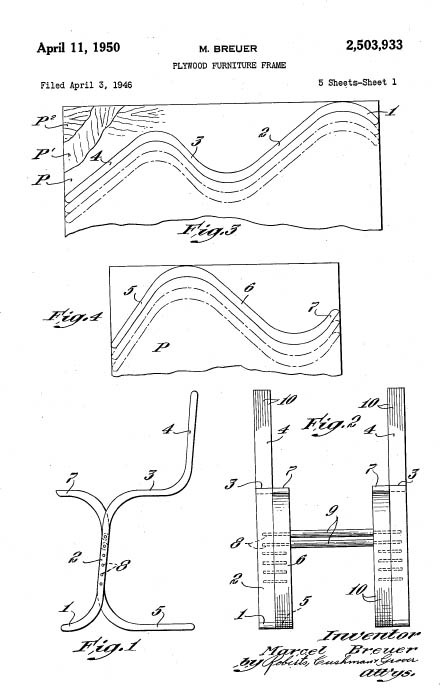 Among the enterprises conducted by the McKays was the Iron City Chain Company that fabricated a wide variety of products made by bending metal. 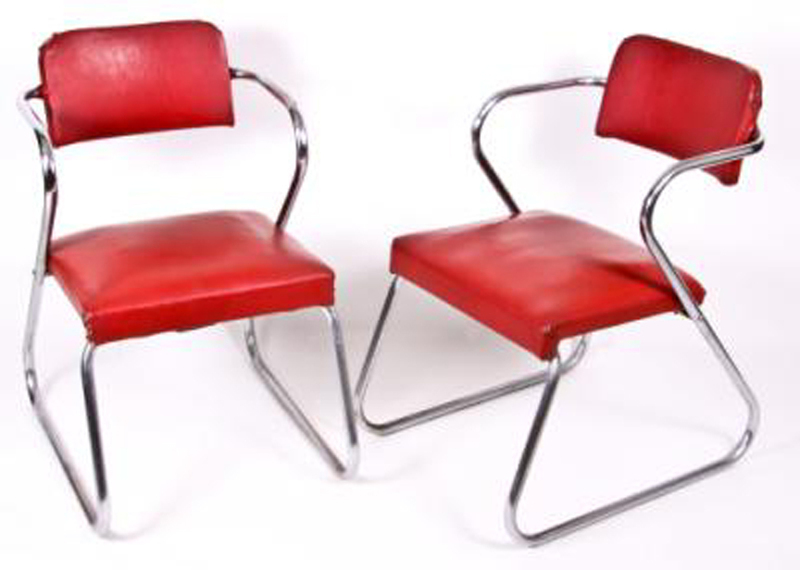 As discussed above, Marcel Breuer was among the first to create furniture from bent tubular metal in the 1930s. 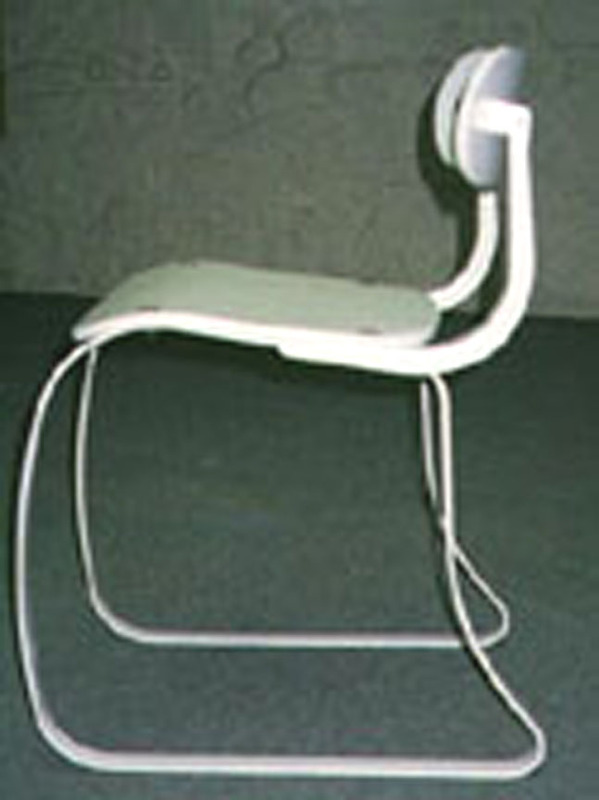 As the fashion for this type of furniture advanced in the 1930s, William R. Mcgowen joined the McKays as a designer and produced a number of tubular and spring-metal chairs, stools, divans, etc. Some of his patents antedate those of Breuer. 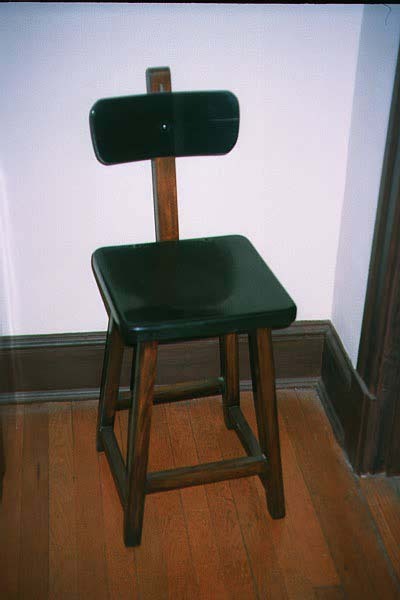 The firm continued to manufacture small quantities of commercial furniture (such as the shoe store stool) and was eventually sold in the 1960s to Teledyne Corporation. I found this "Missionesque" porch swing at a yard sale. Tucked up underneath the thing was the original invoice from the Sears catalogue for 1946. 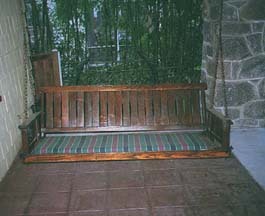 I spent some time carefully refinishing it and now it is a wonderful addition to my front porch. I bought this wicker set at Dixon's auction gallery in Crumpton, Maryland. 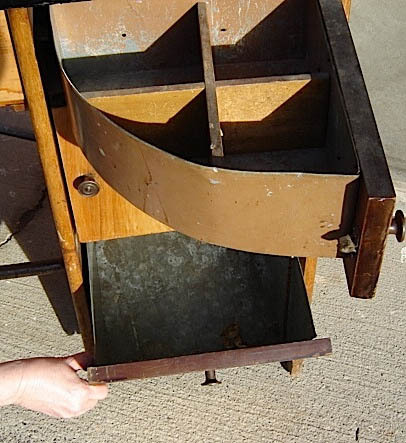 The three major pieces were sold as a lot and went for $20 --- I had to do some repairs and refinishing, of course. It turns out that a hot glue gun works wonders in repairing wicker. 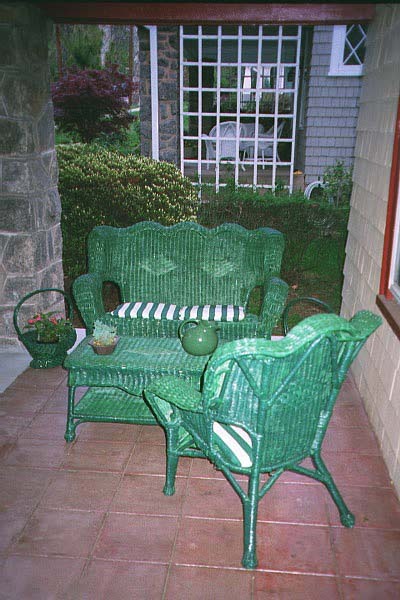 For my money, hunter green is the ONLY color for wicker. The two flower holders were originally gift baskes from Harry and David's (in Medford Oregon). Has anyone seen the film Double Indemnity? Does the phrase "Medford, Orgeon" ring a bell? Another Lucky Find: In July, 1999 I was having my car serviced at the Sunoco on Connecticut Avenue near what used to be Chevy Chase Lake (approx. Connecticut and Jones Mill Rd). During the 1920s, the Connecticut Avenue trolley line ended here and the Chevy Chase Land Company built a recreational facility on a "lake" made by damming up Rock Creek. So, people would take the trolley to come swimming in the far rural outreaches of the city... Boy have things changed! OK, while the car was being serviced, I dropped into the Crestar (...now Sun Trust...) Bank branch to use the ATM. This particular building is a survivor of the old Perpetual Savings and Loan, the ONLY financial institution in DC that did not shut down in the Banking Crisis of 1932. (Perpetual, however, did succumb to the Thrift Scandal of the early 1980s.) On the other hand, they left behind this building, a masterpiece of 1950s international style architecture. If you like this period, you should pay a visit before the number crunchers turn this into a Starbucks. This harkens back to a time when you might actually think of getting dressed up to go to the bank. Boy, that really was 50 years ago... Nowadays, you have to think about washing your hands after you go into most banks. After paying attention to the murals, carpets, lighting and Scandinavian wood furniture, I made my way back to the Sunoco station. On the way, I noted a small table on the street, looking very much like a candidate for bulk trash day. I spent some time finding a worker who spoke English, but eventually determined that the object was, indeed slated for disposal. I picked the thing up and carried it back to the car. 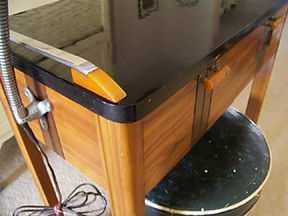 I have NO idea how this got into a bank, but it is an actual Modecraft manicurist's table. 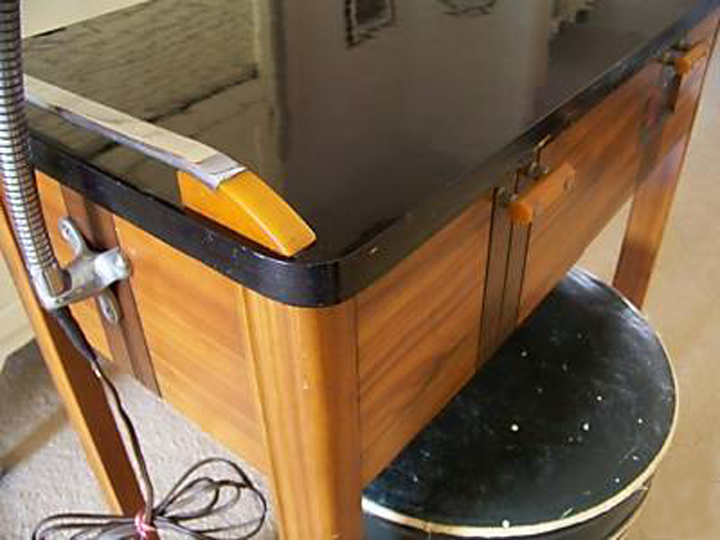 The black top is an early laminate, and the aluminum handgrips on the top are set in Bakelite. The handles on the two drawers were originally Bakelite, but I was only able to find one of them, and so more contemporary brass and chrome handles have been substituted. 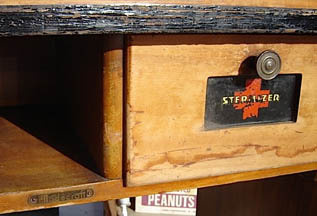 One of the two drawers has a glass front with a red cross and the word "Sterilizer". 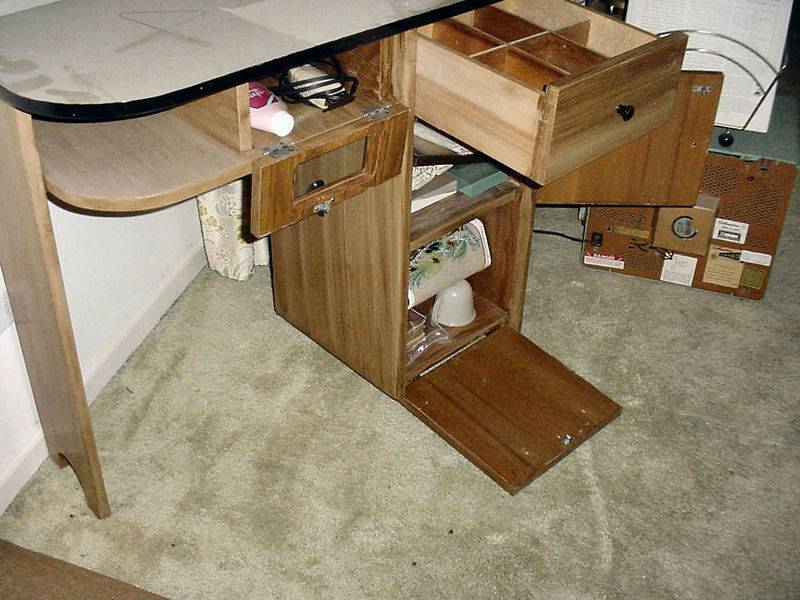 (This is just a drawer and shows no sign of ever having been anything else.) 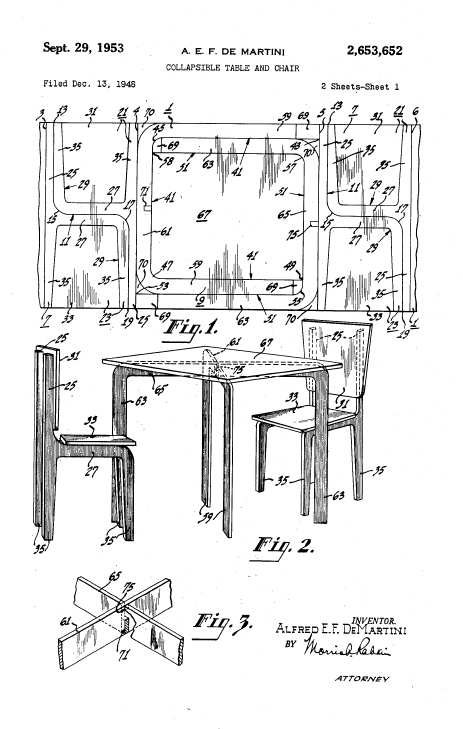 here's the Design patent Drawing or this table. 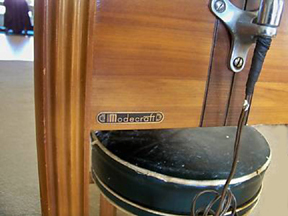 Here are some other photos of Modecraft (also spelled "Mode-Craft") salon furniture. 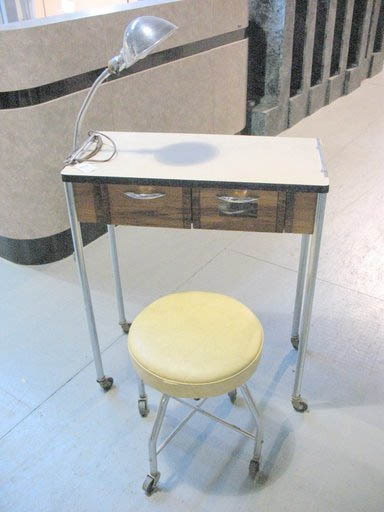 Here is another ModeCraft manicurist table, complete with the revolving stool and chrome "gooseneck" lamp. My guess is that this is a bit later than the one I own. 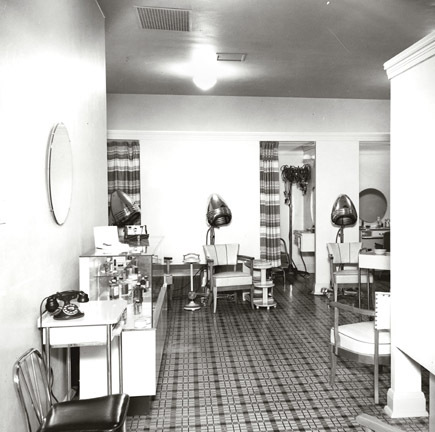 Our friend "Acme Ron" sent us this photo of his mother's beauty shop in Phoenix, taken in the mid 1940s. Click on the photo to see where the various individual pieces would have been located. Thanks, Ron! 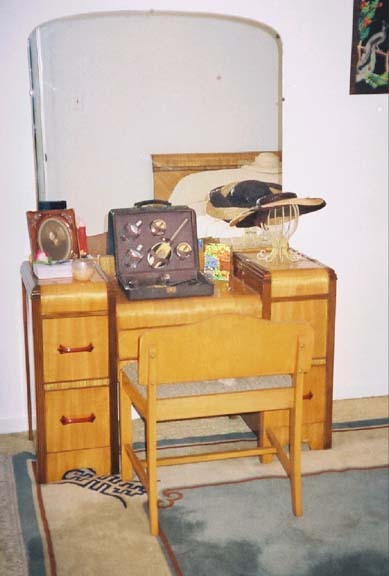 Click to enlarge and see the position of various items.. Here is the Hair Stylist's Station, seen in the back right of the photo (enlarge it to see the station pointed out). Ron kept this and (aside from some dust) it seems to be in very good condition! Here are some photos of a Modecraft salon chair, most likely used by a lady sitting under a hair dryer. Thanks to "Acme Ron" once again for these photos. 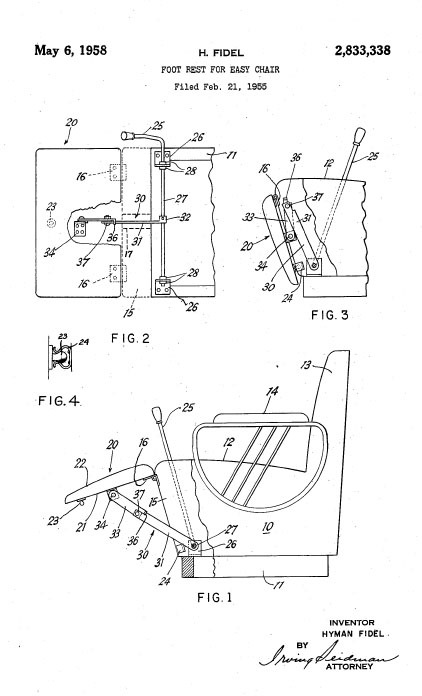 Here are some patents by Hyman and Nellie Fidel, designers for the Modecraft Company. 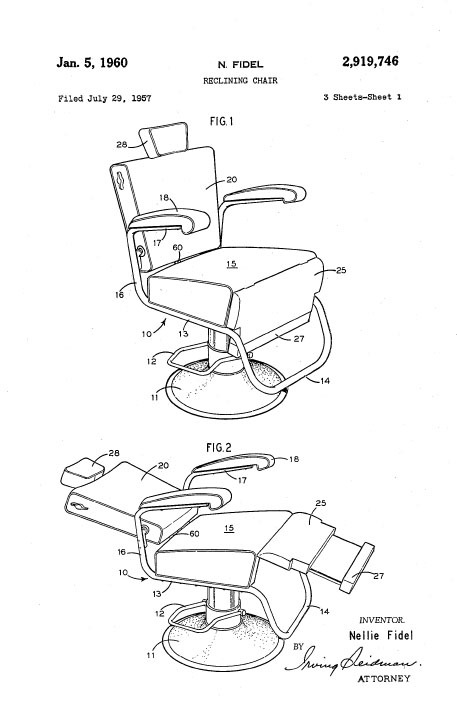 The items include a folding chair, a barber chair and a movable footrest. ...a Great Little Piece of History! The lamp is very unusual. 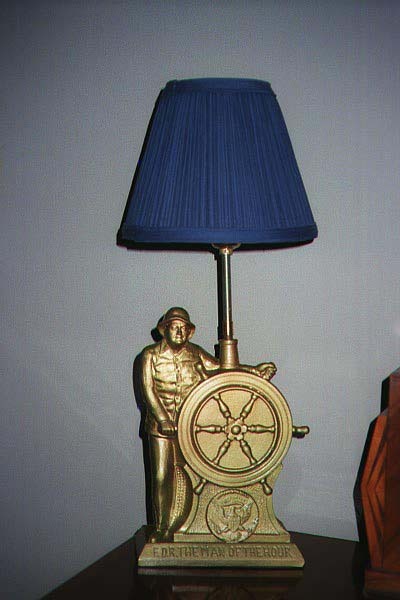 Made of pot metal, it depicts Franklin Roosevelt in storm gear steering the ship of state through troubled times. 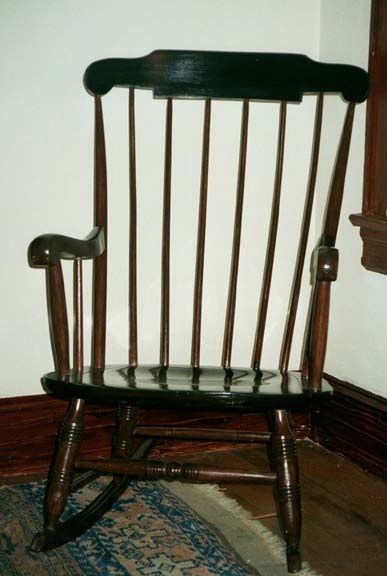 The inscription says "FDR Man of the Hour". 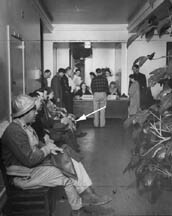 Although the public knew that FDR was permanently confined to a wheelchair, they seemed to be perfectly willing to accept him in this heroic posture. We did a fairly close analysis and concluded that the piece had been brass plated. We did it one better -- we got a book of faux gold leaf and applied it to the lamp. We mixed up a batch of "sizing" --- full-strength varnish with red pigment. This was applied to the piece and allowed to tack up for an hour. The leaves (microscopically thin) are removed from a booklet with a camel brush. You rub the brush on a piece of wool to generate static electricity and you can grab the sheet out of the book. This is applied to the piece and patted down gently with a 1/2 inch artist's brush. The result is very striking. The red pigment on the sizing gives the gold leaf a nice rich color. My partner and I ventured up to Chambersburg. I had warned her that the workshop was filled to overflowing and that we were NOT going to come back with any restoration projects. As we approached our very first thrift store, this resolve dissipated like a light fog. We didn't even have to go into the store. On the sidewalk in front of the store were three forlorn kitchen chairs tied together with string bearing a hand-lettered card that read "All three for $1". 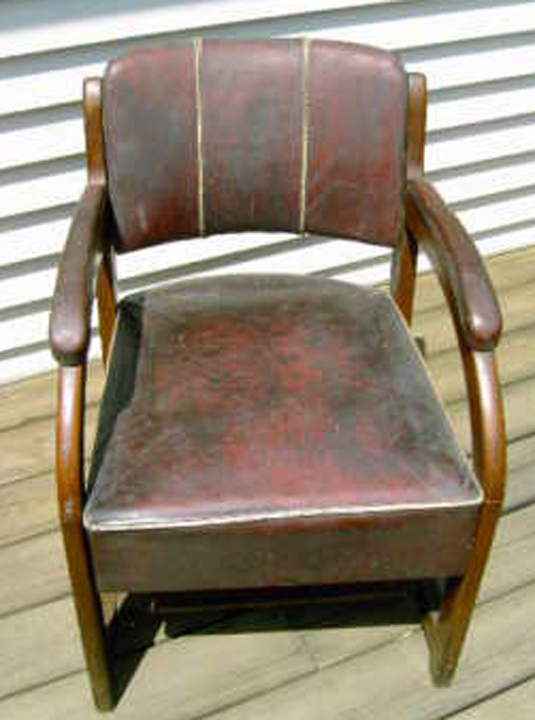 My partner calls me the "patron saint of chairs" because I have this thing for restoring chairs. Usually, these things are junk, but I made a cursory examination and found that we had struck gold. But first some background. In the 1920s, Marcel Breuer made history. He had a philosophy of reducing things to their bare minimum. 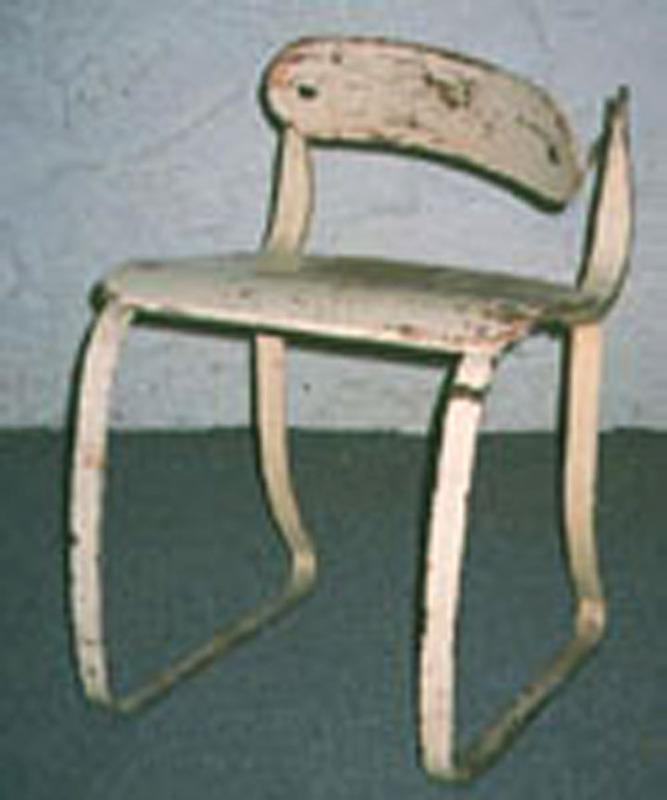 As part of this, he created an art object --- the bare essence of "chair". 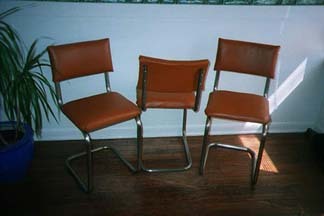 No, the three forlorn chairs are NOT Breuer chairs. 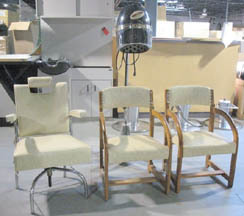 They are, however Douglas Kitchen Master chairs. My father was in the kitchen business for years and for many of those, I was dragged along, so I have intimate knowledge of kitchens of the 1950s. Dad always specified Douglas Kitchen Master chairs because they were made with real chrome tubing --- they would not rust, dent, or in any other way deteriorate. 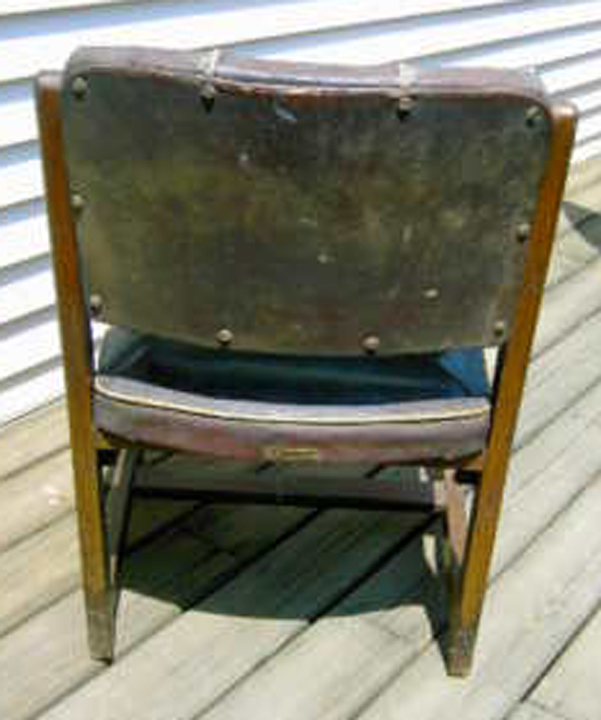 And, when I did some cursory rubbing onthe forlorn chairs in Chambersburg, layers of dirt, paint and grease came off easily to reveal the chrome below. Although leather is very hard to work with, the results more than justify our $1 investment! First of all, let us say that we are more-or-less devoted to preserving the 1940s and we DO NOT ADVOCATE SMOKING. 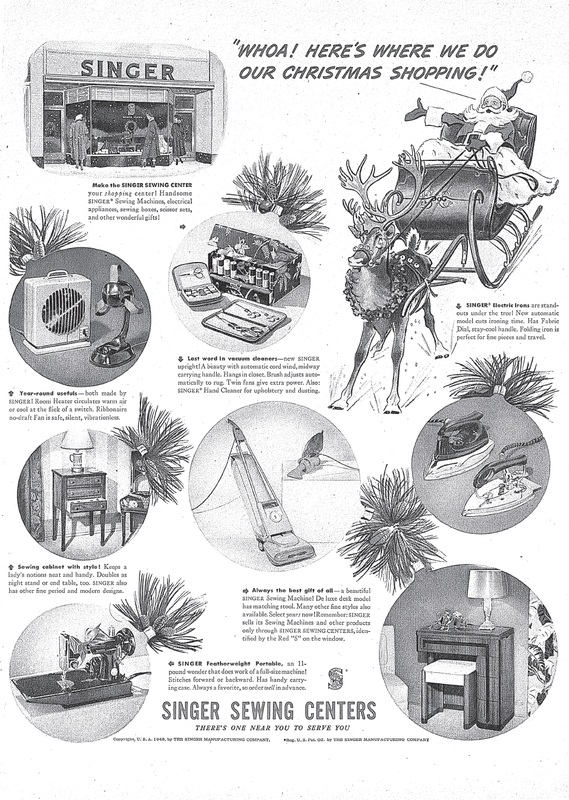 This item is definitely not Politically Correct today, although something like this was a fixture in almost every American household during the 1940s. 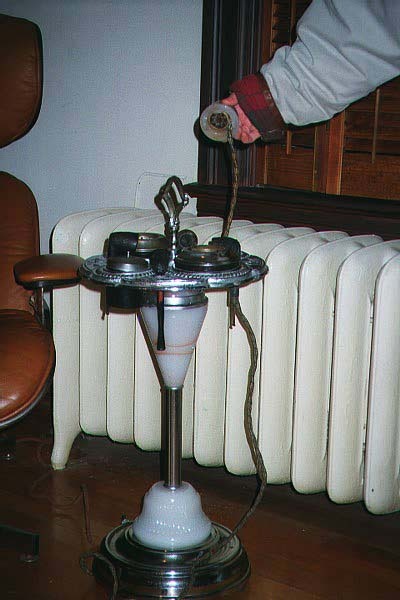 Alas, it has no use except as a smoking stand. We certainly understand that some of our readers may be concerned, but we got this as a sociological curiosity. The base is made of stainless steel with unusual globes of opalescent milk glass. The top is cast aluminum and is decorated with Western themes -- a six-gun, a covered wagon, a stage coach and horses. The accessories include two ash trays, a cigarette holder, and a cigar/cigarette lighter. 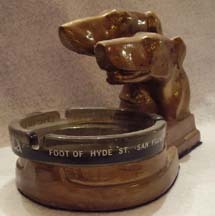 There are receptacles to hold four pipes, as shown. 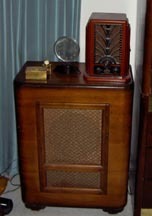 The base is lighted and emits a soft glow when all the lights are out except for the smoking stand and the dial of the radio. Just the scene for listening to the Lone Ranger on a winter night. 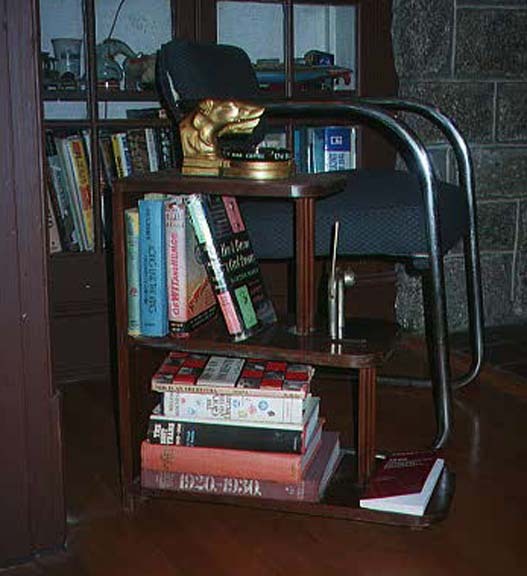 This is precisely the type of object that sat beside Dad's Chair, from which Paternal dictates (as in "You'll have to ask Dad about that") were interspersed with reading the paper. 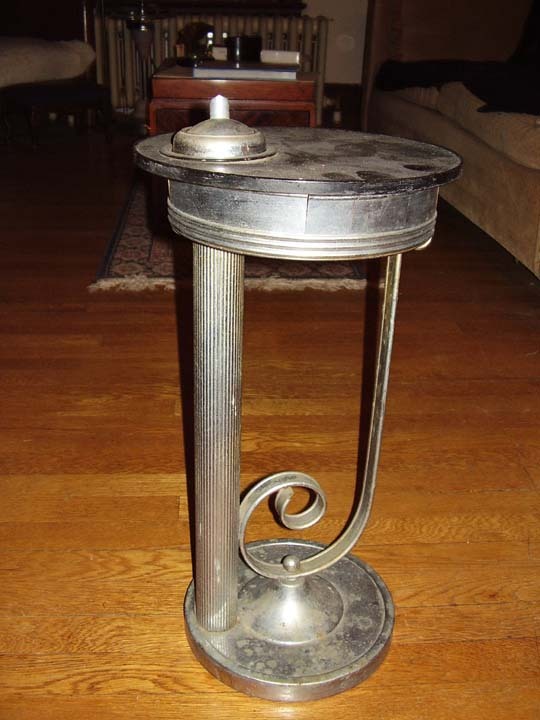 In my family, the Smoking Stand is an icon of patriarchy and probably was so in many other families of my generation. Political correctness aside, we felt that such an item was essential to our 1940s restoration. "... 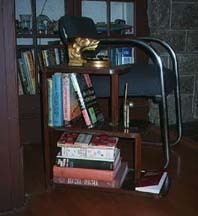 I have a smoking stand almost identical to the one pictured on your page. The lighter on mine however went the way of my older brothers and or sisters, as you mentioned in your article. This was purchased for my grandfather for his 50th birthday in 1953. I need to rebuild the guts in the lighter. I was wondering if you could take a look at your cigarette lighter and describe to me what all is in the guts, I suspect it was a coil like you would find on a old space heater. If you have a digital camera, a photo would be great. If not please don't bother. Any help you could give would be greatly appreciated..."
The metal Grille is press fit onto the molded ceramic core; it can be removed by bending out three strategically placed "dimples"
At the center of the ceramic core is a hole which leads into the shaft; A bolt goes through this holder and holds a brass cup (not shown). A nichrome wire spring is attached to the head of the bolt. The nichrome wire spring winds around the spiral groove where it is attached to a bolt that runs through the ceramic core (you can see the end of the bolt protruding through the core in the picture.) This is the "live" bolt. A "dummy" bolt goes through the other side of the ceramic core. 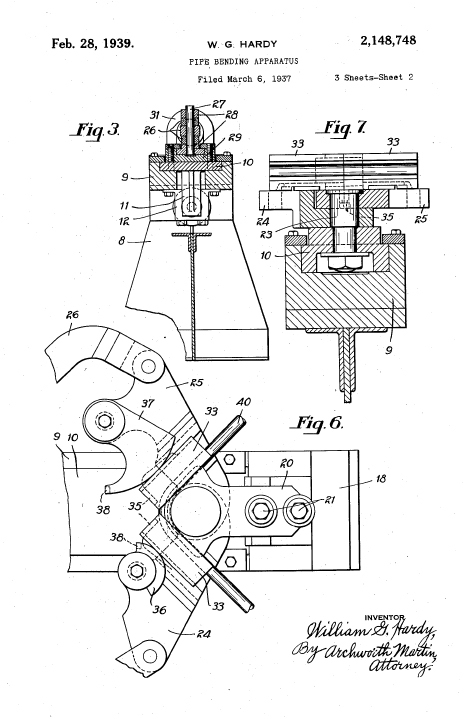 The Steel shot [Part D] is inserted in the cup. 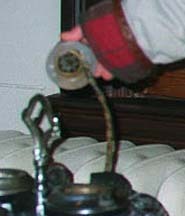 The cap [Part C] is placed on top of the cup and is mounted on the "dummy" bolt. The fiber washer is placed atop the ceramic core. 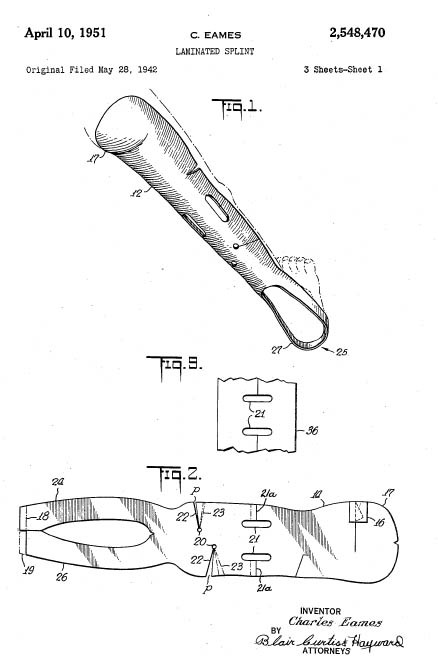 The slot points to the "dummy". 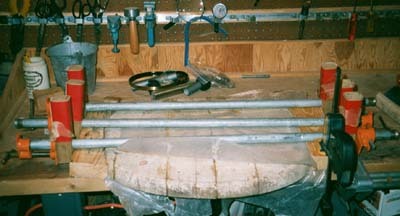 The insulation is stripped from the cloth covered wire. "Eyes" are soldered to the wire. 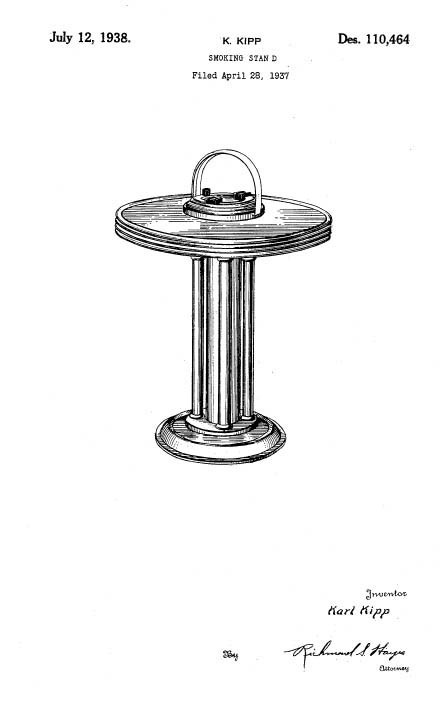 The "High" side is connected to the "live" bolt; the "Low" side is connected to the "dummy" bolt. 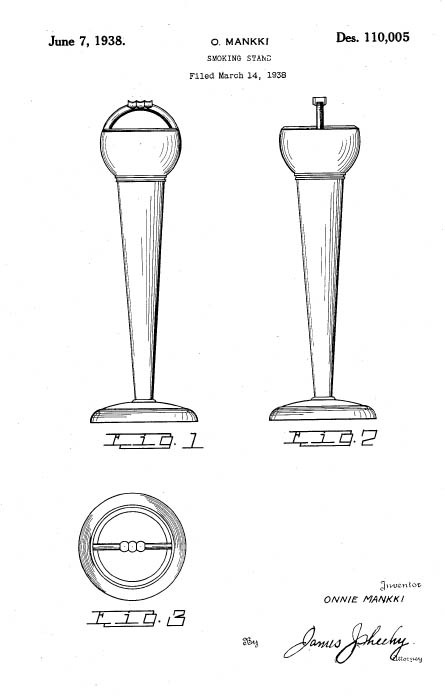 The two nuts are used to secure the wire "eyes" to the bolts. 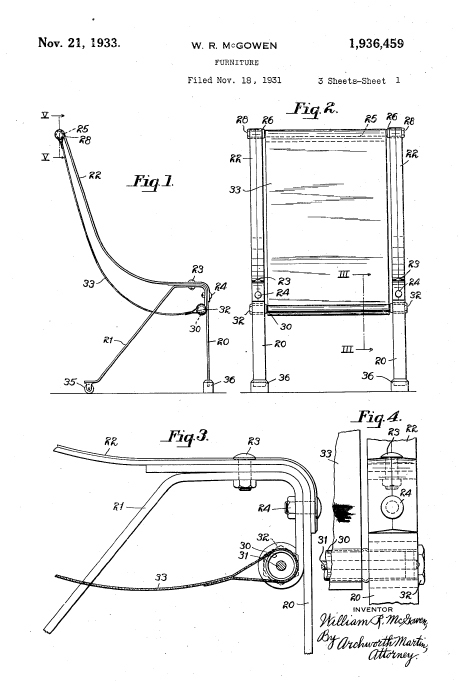 The completed apparatus is inserted in the glass holder [Part A]. 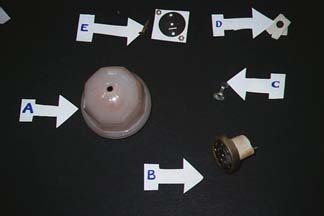 A miniature screwdriver is inserted in the hole at the top and is used to align the hole in the fiber washer with the center. For safety sake, I wired the lighter cord so that the light in the base has to be switched to the "on" position for it to be hot. Assembly is made a whole lot easier if you have nut drivers. All bolts and nuts are standard sizes. You can buy a nichrome wire coil at an appliance repair store. The ceramic element and glass enclosure are unique to the piece. I got the right insulated wire by cutting the cord off an old waffle iron. PLEASE! Don't restore one of these if you have children in the house! 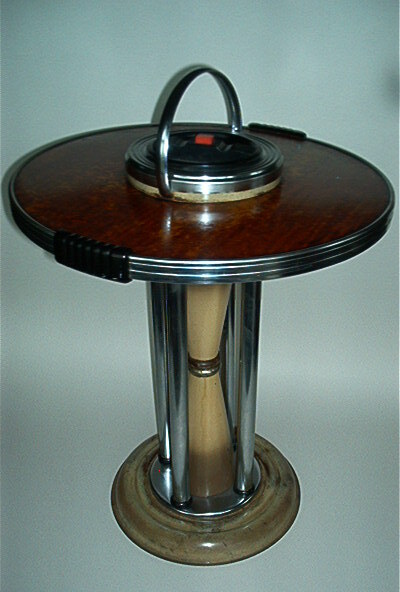 Here is a smoking stand with definite Art Deco Lines. It has no markings, but it certainly sets the mood of the Swing Era. 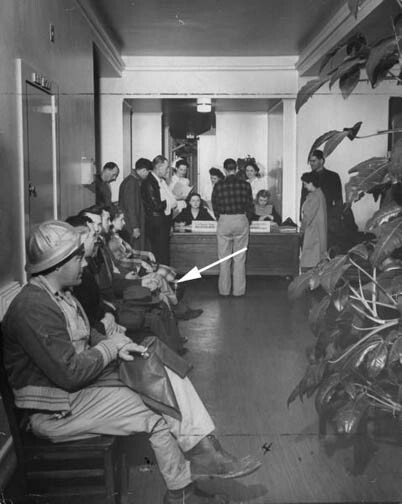 The next smoking stand is almost invisible because it was found everywhere -- particularly in crowded waiting rooms and seedy hotel lobbies. It was designed by Onni Mankki, a Finnish designer/architect who settled in Cleveland Ohio. This set of photos illustrates the things that you can do with stuff that other people throw away. My partner and I attended a rummage sale at a church in Chevy Chase. 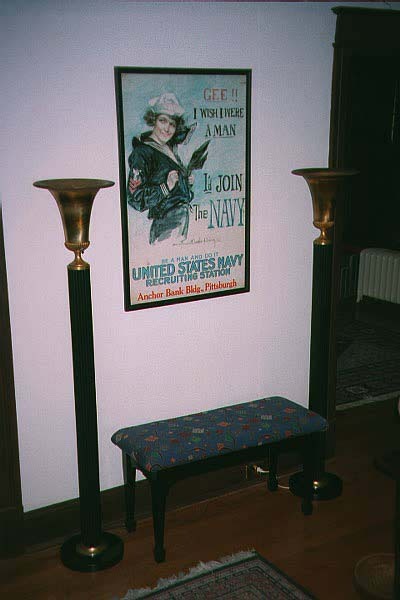 I found a tubular steel Art Deco chair sitting off in the corner --- it had a $1.00 price tag on it, but it was in unusually bad condition. 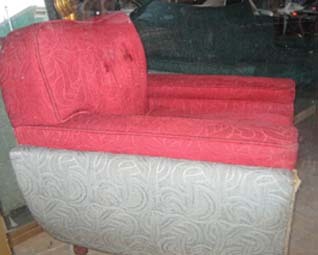 Someone had re-upholstered it in very bad "nausea Green" Naugahyde. (NO Nauga should perish for this horrible color...) On the other hand, the chrome steel tubes of the chair form the outline of a perfect cube. 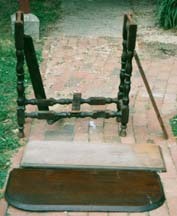 I peered beneath the dust cover and noticed an oak frame with springs that had been attached by hand sewing. This detail and the aesthetics placed the piece in the late 1920s, early 1930s, so I took the fateful step and got out a dollar. One of our readers suggested that it may have been the work of designer Gilbert Rohde. It certainly has a lot of style. On Wednesday, We trip to the Fabric Store. We spent about an hour peering through the remnants bin. At the bottom of the pile, we found the perfect fabric --- it looked great and it had a regular small pattern that would be easy to match. Fabric and thread came to $25. 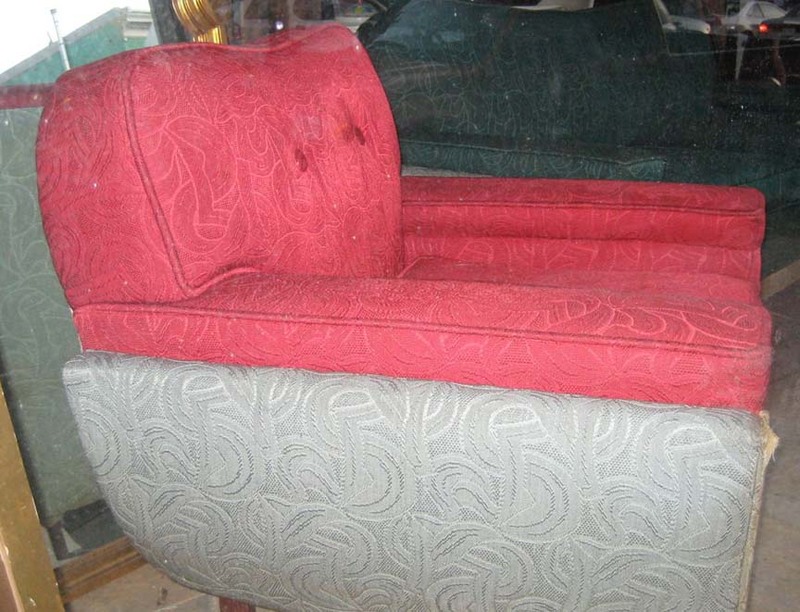 Next, we went to an Upholstery shop. I had decided to replace the horsehair with three inch high density non-degradable foam; prices for this stuff are sky high --- enough foam and dacron batting for the job came to about $30. The cushion requires welting between the seams, so that means sewing through four layers of cloth. My sewing machine would not handle the thickness, so we had to sew all the cushions by hand, something that kept us busy for another four hours. Pulling, tacking and stapling consumed another two hours. 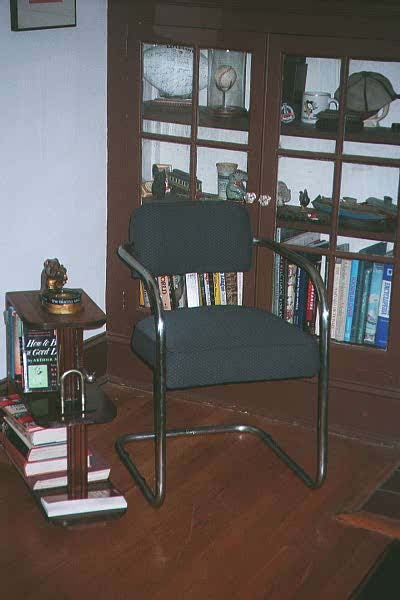 By the time that we proudly placed the chair in the living room, we had invested about fourteen hours and about $60 in our dollar chair. Some things only look like bargains. 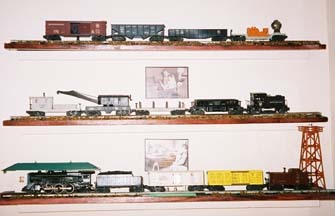 The photo also shows some of our other treasures. 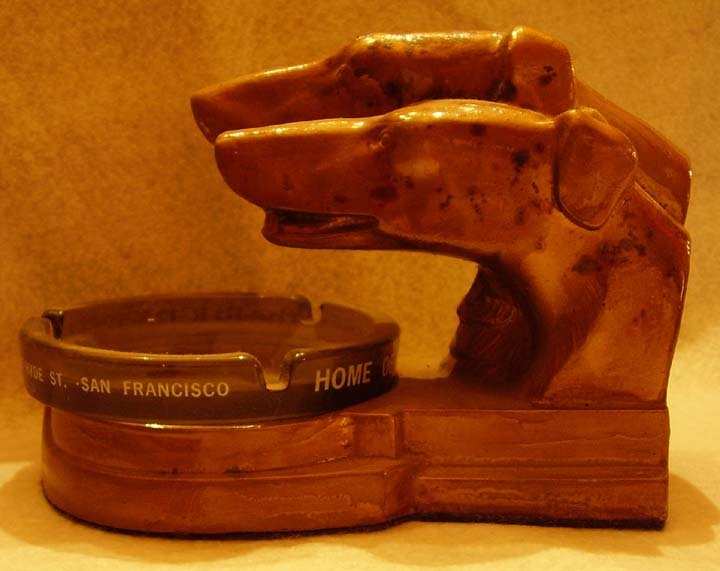 On the little bookshelf is a FrankArt Ashtray featuring two racing greyhounds, and a bookend called "Scaredy Cat" from the 1946 Chase Art Metal catalogue (shown in detail on our Knicknacks Page. 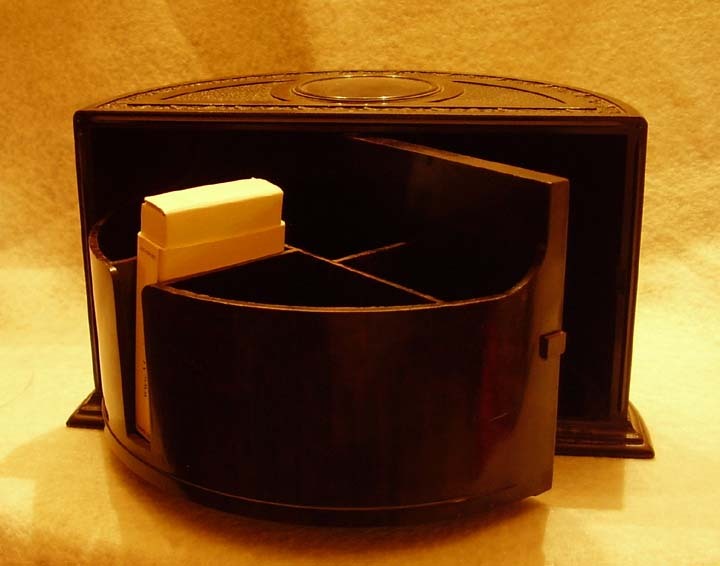 We just acquired a bakelite cigarette box that operates in the same fashion as the martini bar. With considerable effort, we were able to repair and refinish the Bar. We are indebted to the folks at Read Plastics in Rockville who custom cut a piece of 1/2inch black lucite to make our table top. In the background, you can see some of our other "found" treasures, including a streamlined vacuum cleaner, a western-theme lighted floor ashtray, an Eames Chair (YES! Someone in Chevy Chase actually tossed out a REAL Eames chair AND the ottoman! ), and part of our collection of vintage newspapers. 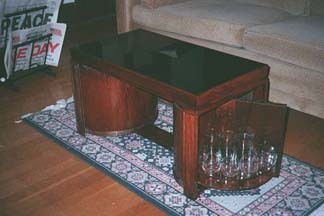 The beautifully veneered ends swing open to reveal the glassware and equipment necessary to make the perfect Martini. The only fly in this ointment is that we don't drink... But, we have a souvenir from the period when the Martini was all the rage.